Okay vanners, here it is. As far as i am aware the x series panel vans with the lift up tail gate were a factory option for a standard panel van in the 70s 80s & early 90s unless you were purchasing the 'S Pack', 'Surfsider' or the 'Sundowner' models. 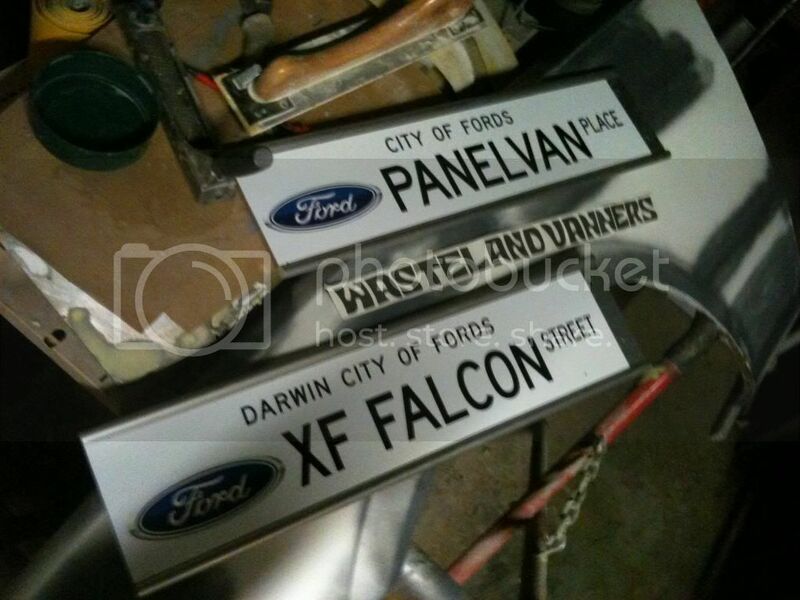 (Sundowner, being Fords answer to the well known & famous Holden Sandman Panel van). These vans now 20-30 years later are becoming more popular & sought after than ever before, but unfortunately are becoming extremely rare & therefore also becoming quite valuable. Most of these lift gate vans now are in a pretty sad & rusty state though & are being chopped up & parted out. So if you have a van with barn doors this is a great conversion to consider to increase the value, practicality, rear visibility, & of course enhance the style & looks of your van. The finished product will be sure to turn heads. So after 12 months or so of searching high & low for the required parts on eBay, Gumtree, scouring wreaking yards, talking to other van enthusiasts on forums, blah blah blah, I've been pleasantly blessed by the man above, & have managed to acquire the needed parts to convert my 1993 xf van restore project to the cool bananas lift gate style van that Iâ€™ve always loved. LOL. ( A quick thanks to all you guys that have helped out with parts & answered questions ). Then after hours of Google searches to get a bit of guidance for the job, from someone who has done it & taken some photos of the surgery along the way, um well I came up with absolutely 'zip'. So stay tuned to this channel over the next couple of weeks or 3, as i run through the process step by step, with photos of course of this well over due guide. First of all, a word of WARNING, straight off the bat, I'm going to say, that this job is definitely not for the faint hearted & you should only tackle this yourself if you have some sort of experience with welding / metal fabrication, using power tools & automotive body works. 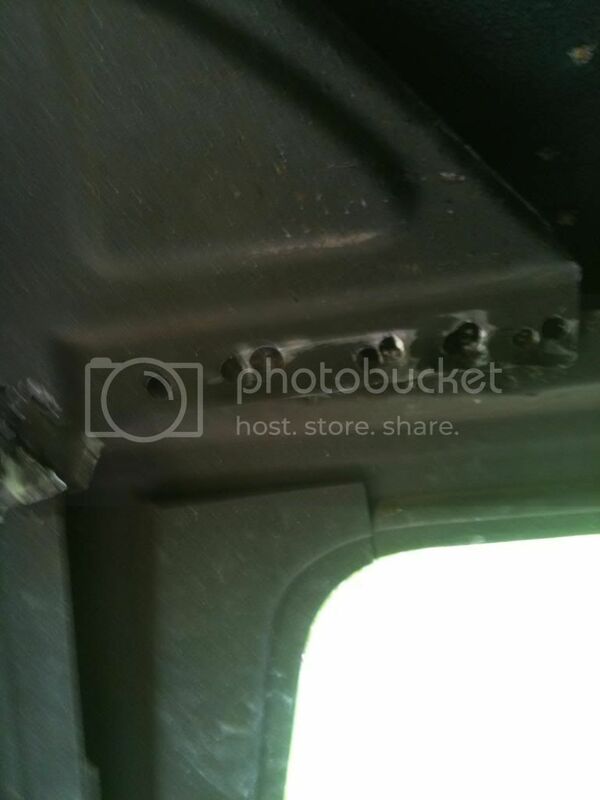 If you mess this up, you're more than likely going to destroy your panel van beyond repair. So don't say I didn't warn you. If you're confident great, have a crack like I did. If not, get some help from someone who is, like a panel beater. You're also going to need a few special tools to get through this. Don't be disheartened if you can't find the parts at first, it may take some time & effort. Remember this stuff is becoming pretty thin & sought after, so be prepared to put in some effort & some $$$ once you do find them. They are there, & as I said earlier search eBay & other auction sites daily, search wreckers & ask people on forums & you will find them. 2. 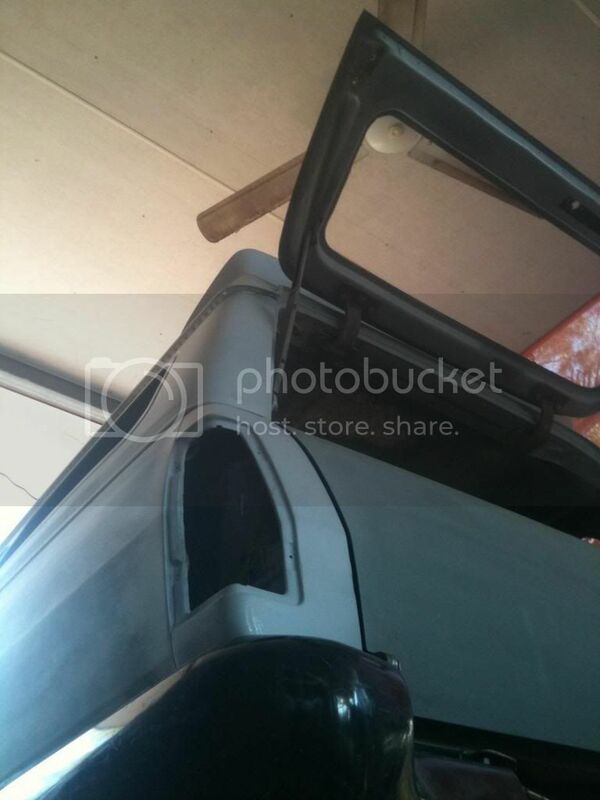 Upper, lift tailgate door. Pretty sure that the xa through to xh tail gates & upper doors are the same but someone is welcome to correct me if that's wrong? 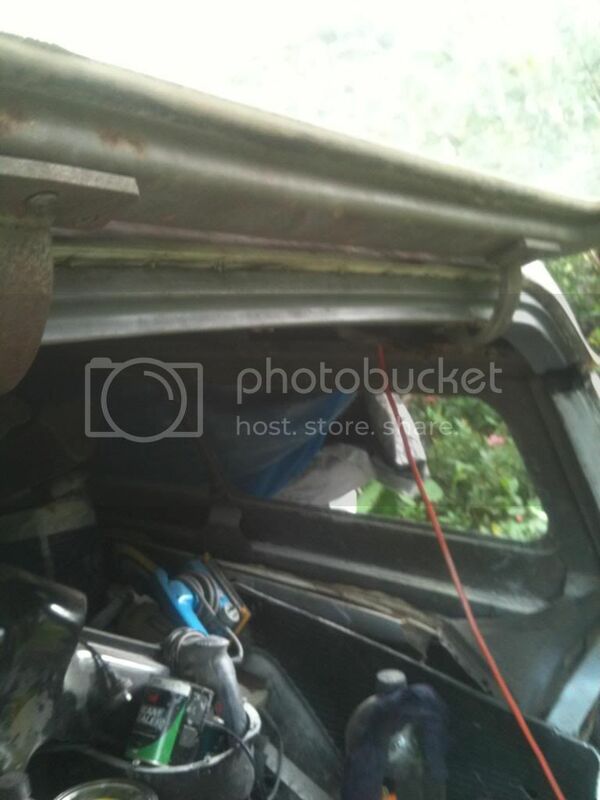 The barn door vans have a completely different profile than the lift gate models on & around the top gutter area, so it's not just a matter of welding the hinges in to the existing roof brace & youâ€™re done. All this we will be cutting out. So if you're getting the brace from a donor van that still has it in place, make sure you have a good look at the way it's all put together & take some photos for further reference later when you're welding it all back in place again. You can cut it off straight through the horizontal skin part of the roof above the gutter & then through the side leg supports were the circles are pressed into the steel. 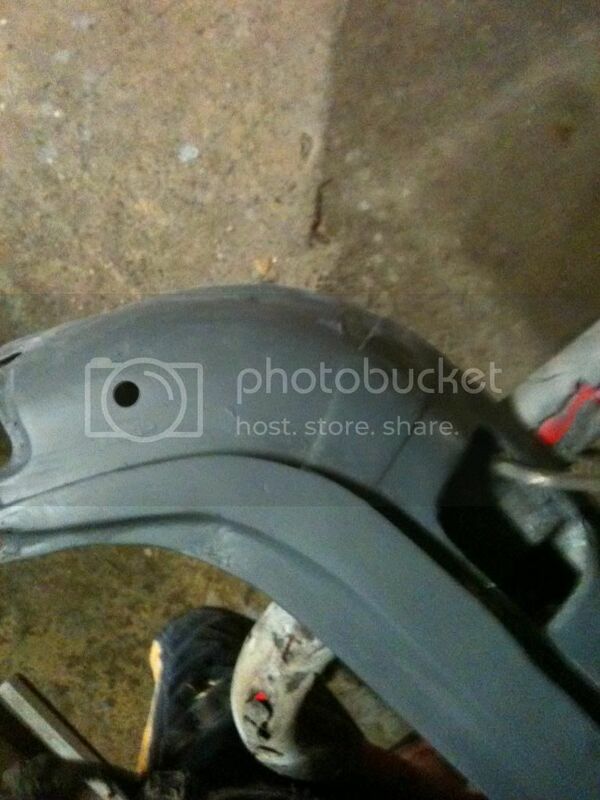 Using these circles will give you a good guide when welding it into place later to get it all positioned properly. Even if it's rusty in this side leg support area, like most of them are, don't worry, just cut the rusted area & all out with the whole piece. 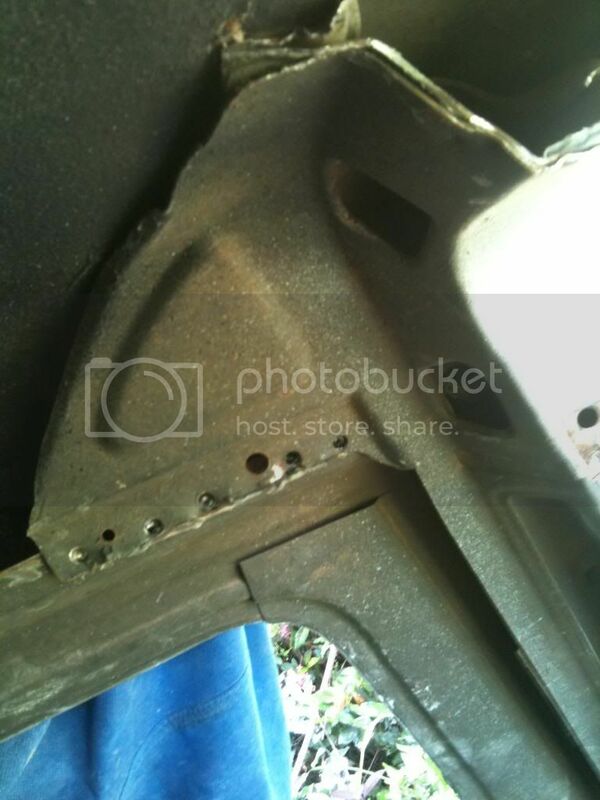 It's easier to patch up the rust before you weld it back in place, than it is to be trying to re fabricate the correct shape of the profile because it's been cut off too short, cause you didn't like the look of saving the rusted bits. You'll see what I mean. 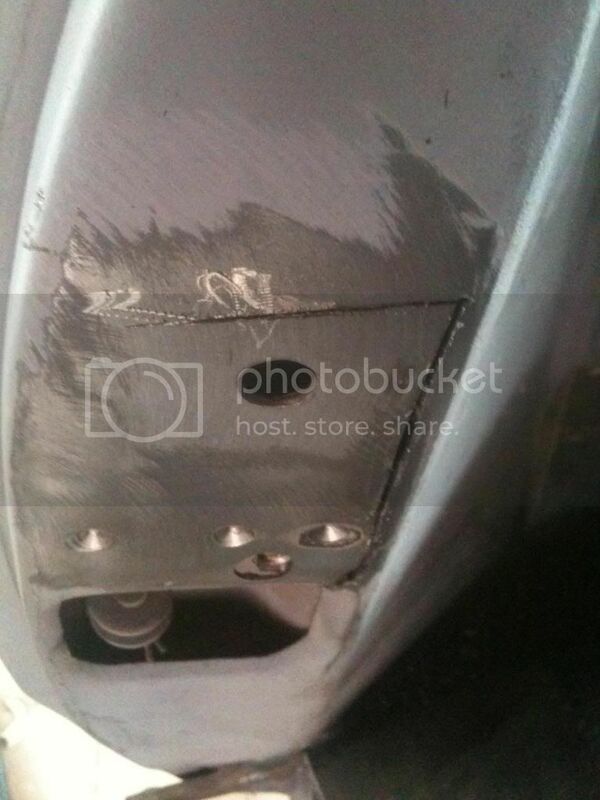 The top corners of the lower tailgate will have to be trimmed to allow it to close properly, more on this later. You'll have to cut from a wreck the section of panel on both sides that the lower tailgate hinges screw into right up to the lock catch section . 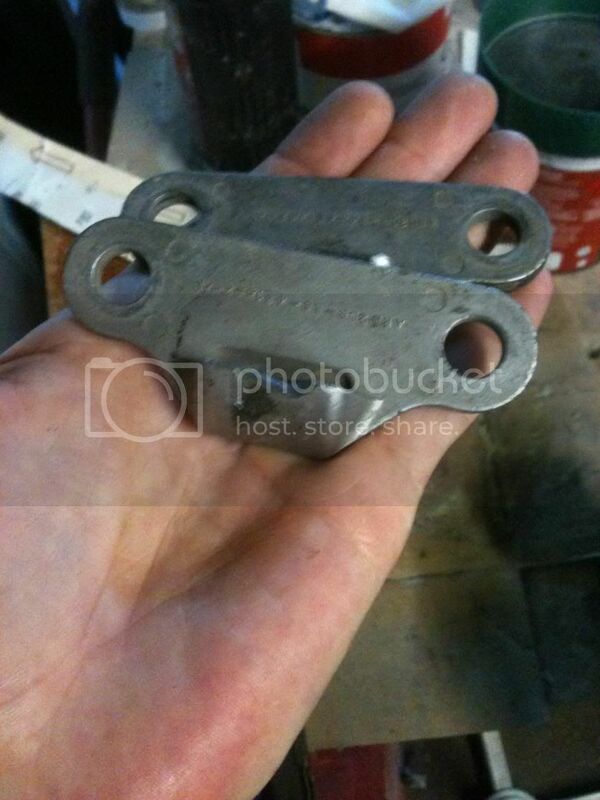 These are the cast brackets that the tail-gates lock into. You can use the ute ones for the locking mechanism on the top gate as well.. Don't just go for the first set you come across like I first did. 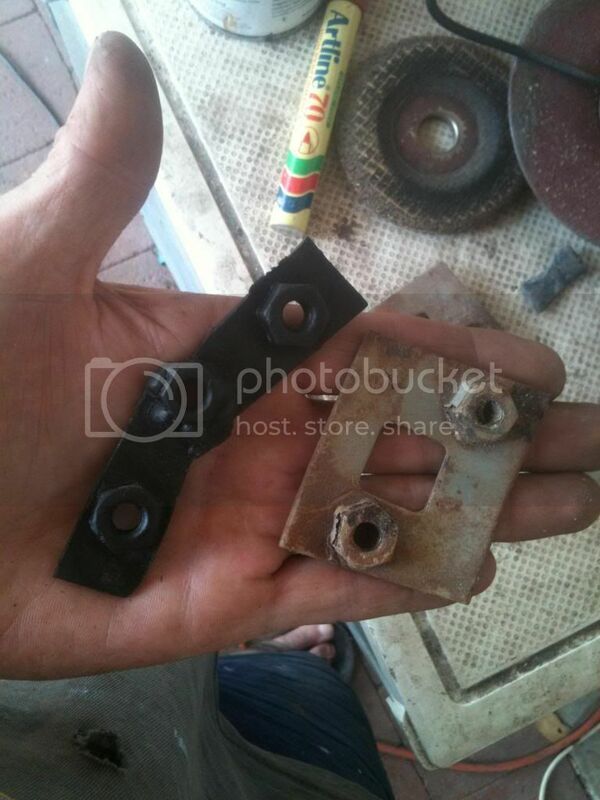 There's good one's & there's crappy worn out ones as you see in the pictures here. these are worn out ones . These ones are heaps better, see how the edges aren't worn nearly as bad. 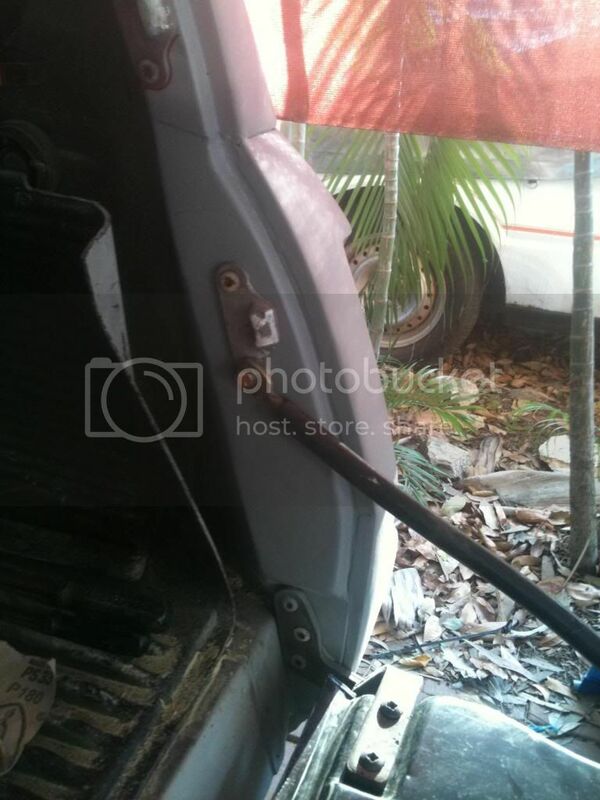 If you cant find the original mechanical type struts you can use gas struts like the ones that hold your bonnet open. Some people prefer to use these gas struts anyway as the old mechanical ones can be a bit rattly. So that's it for this week, unless i think of something during the week that I've forgotten so far, that I can quickly edit in. Next week I will be covering the tools you'll need & start putting up some of the photos I've taken of the process of unpicking your barn door roof brace & patching any rust in the lift gate hinge brace before it gets welded in. 1. Wide jaw vice grips. 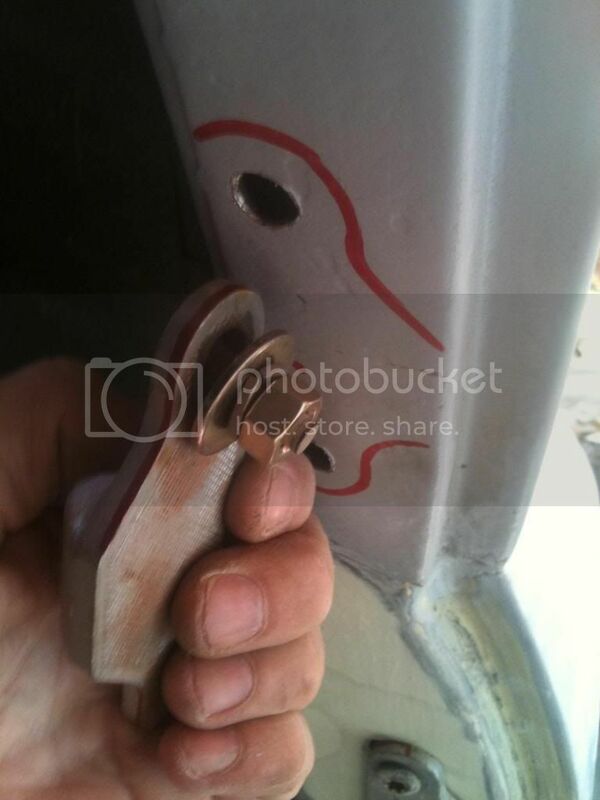 These type of vice grips are good for welding up boxed sections & holding things in position. 2. Spot weld drill bits are great for un-stitching spot welded panels. They allow you to drill through one layer of steel. Later you can weld the layers back together by clamping in place with the wide jaw vice grips & simply weld through the top layer hole. This one is a 8mm cobalt type, you can get them in 10mm as well but 8s are fine for most spot welds on Falcons. 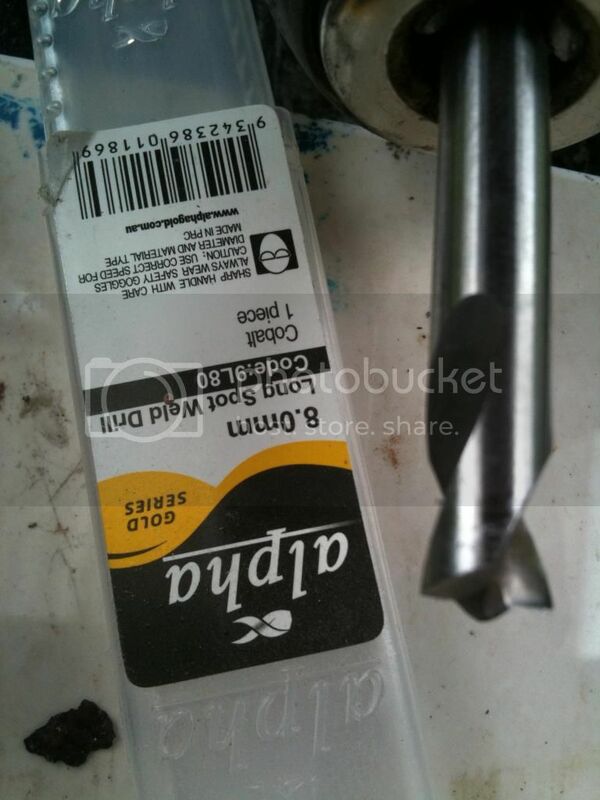 You're probably not going to find these drill bits at your local Bunnings & will need to go to either a tool specialist or at your nearest paint / panel supplies shop. Have also seen them on eBay. 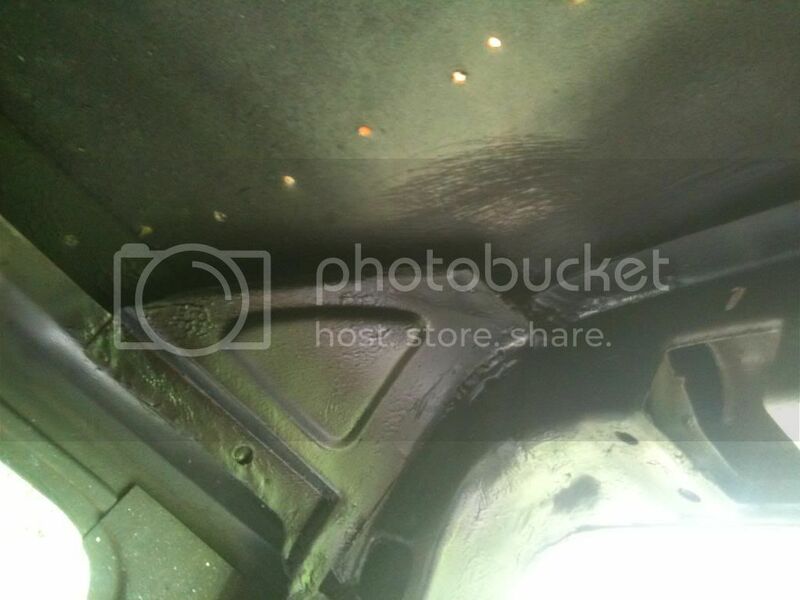 About $25 but you should be able to get a few thousand welds drilled out before it needs replacing. Just go easy with them so you only drill one layer of steel & keep it sharp for as long as possible. 3. Torx bit keys for the hinge bolts I've found.some will have these but others will have your standard Phillips head type 5/16 bolts. 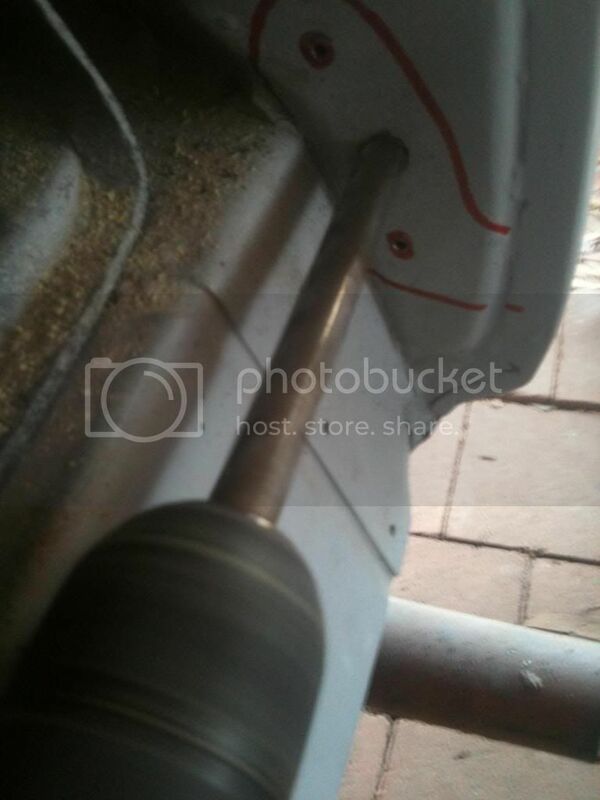 4 inch angle grinder with cutting, grinding, sanding disks. Don't forget safety glasses, eye protection. Ball-pein hammers, large & small. Cold chisel, not the Barnesy tunes you'll be listening to LOL, but the tool used for splitting the spot welds after they're drilled out. Extra large flat blade screw drivers are a handy levering tool. cause you no end of headaches with it jamming up in the gun constantly if you are running the same diameter wire as in your gun. Please don't try to use your trusty old stick welder, MIG will give you much better results. Wire brush for cleaning off welds. 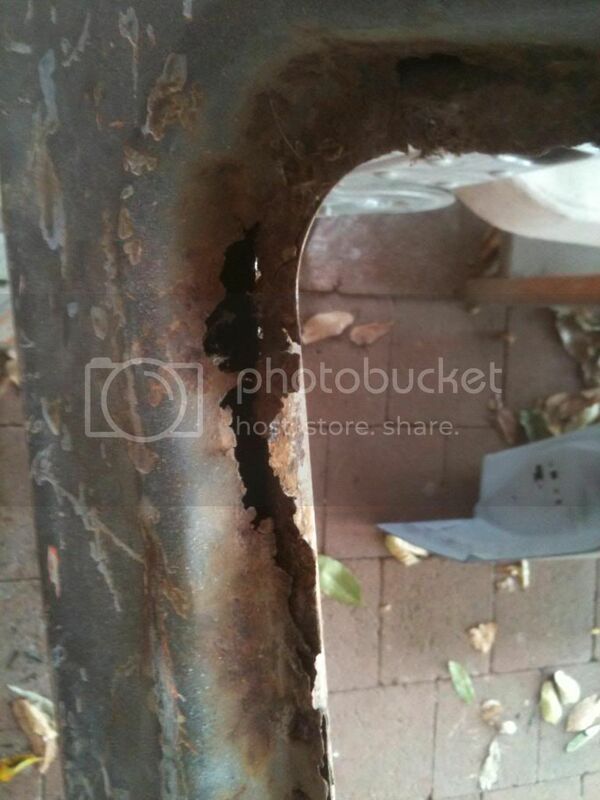 Step 3: Repairing The Rust Before We Start. 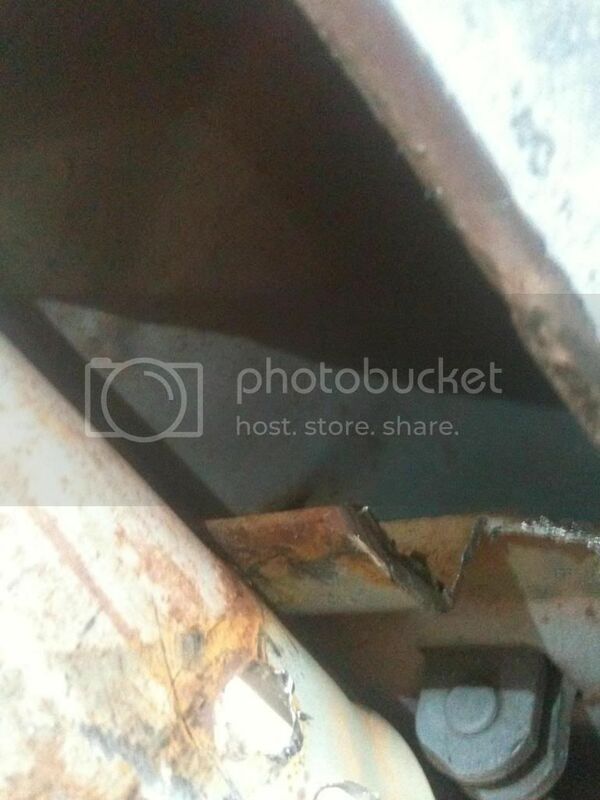 This section of the roof brace was pretty rusted on both sides & needed to be re-fabricated. 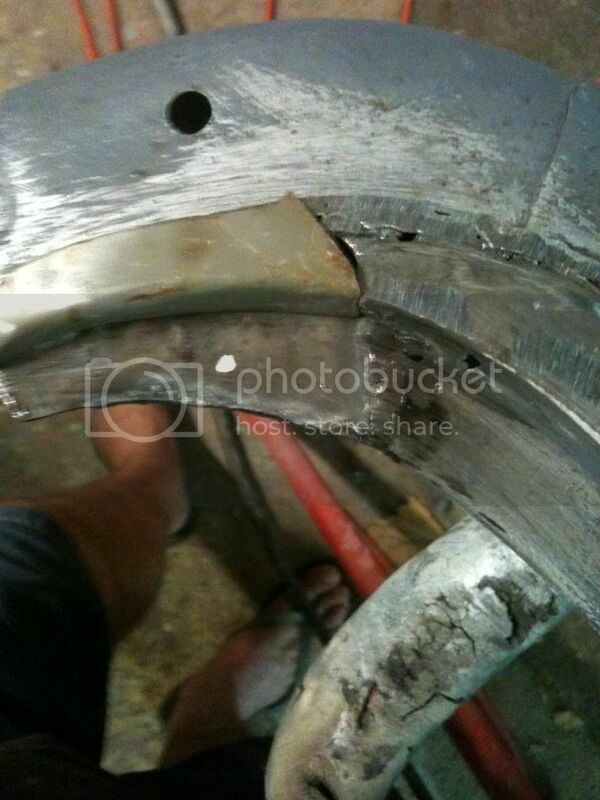 It's a lot easier to fix this now before we weld the brace in place. 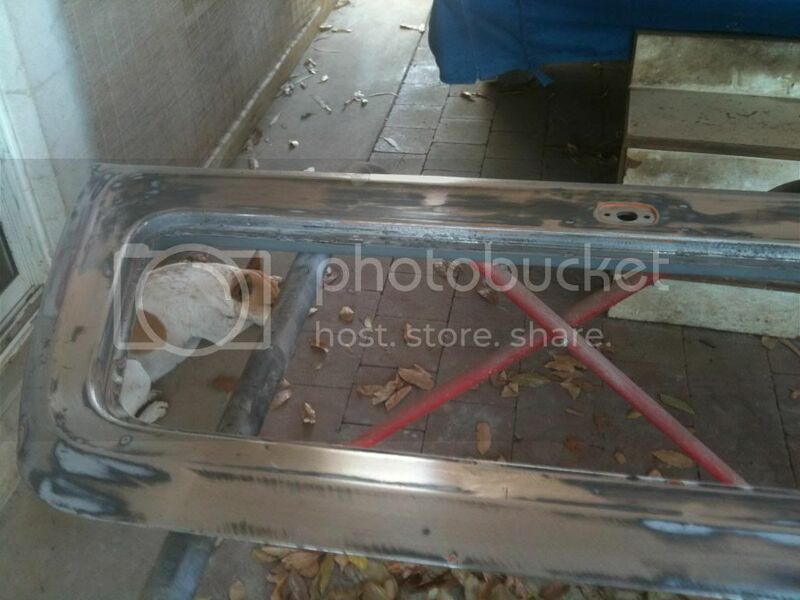 All welded up & coat of etch primer. Looking much better. 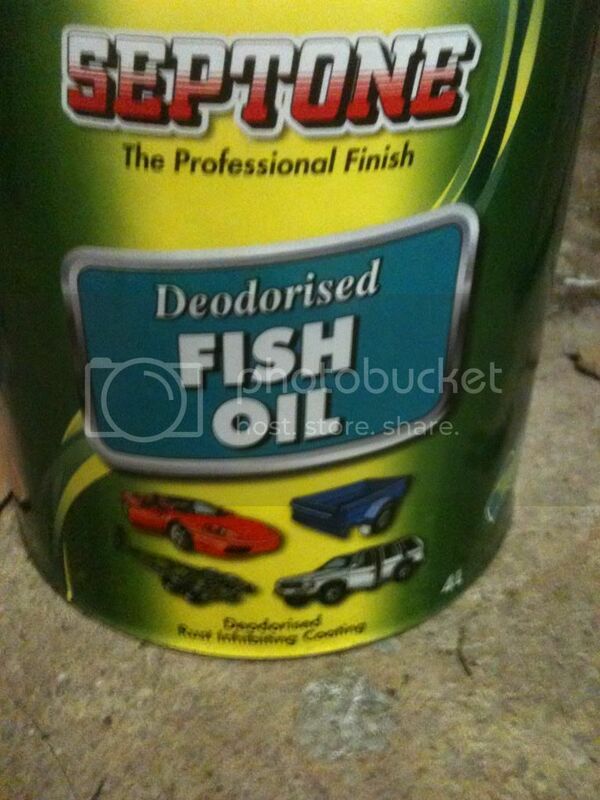 â€‹Now is a good time to soak up the inside of the roof brace with plenty of fish oil to prevent any further rust from starting. Just literally pore it in with a cup & tip the brace up & down in different directions, then let it sit upside down for a while so the oil can penetrate into all the nooks & crannies. 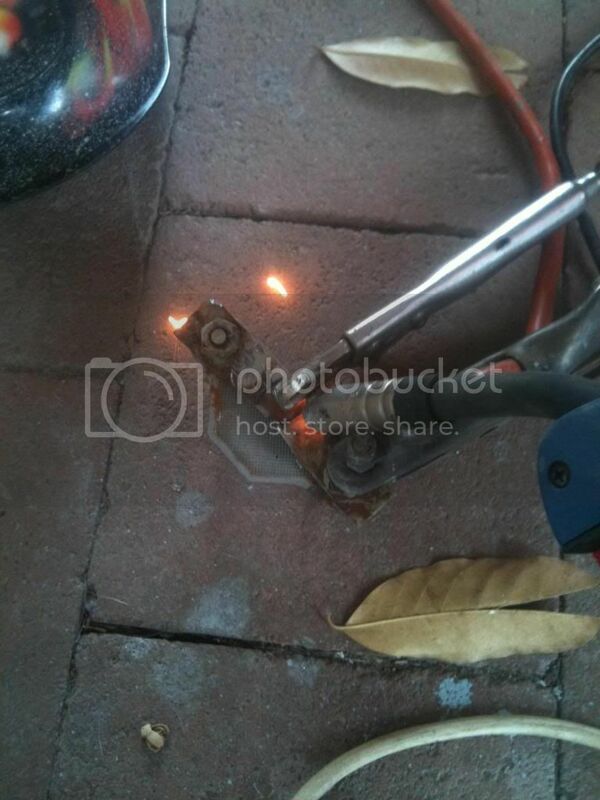 Some of the oil will burn away later from the heat of the welding, but we can squirt some more in afterwards. 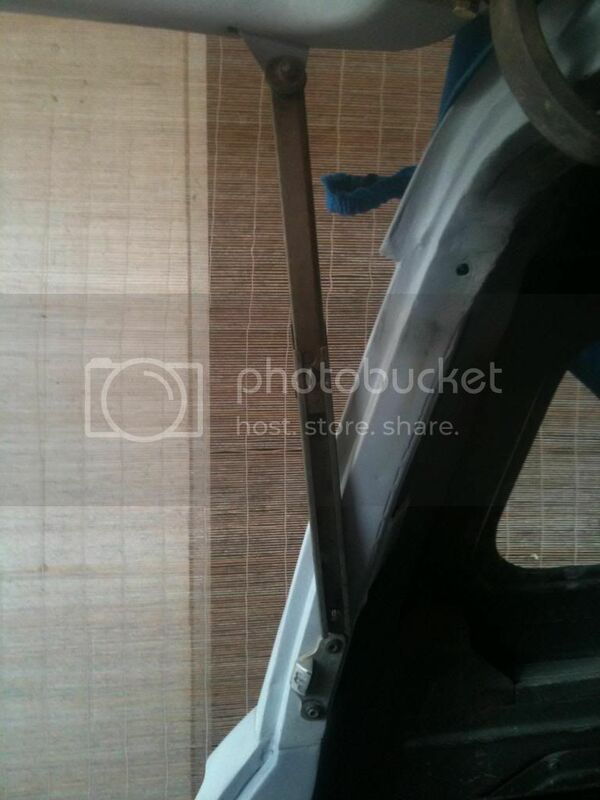 Step 4: Unstitching Barn Door Roof brace Spot Welds. Okay now the fun part begins. It's time to start drilling out spot welds & cutting out the barn door brace. 1. 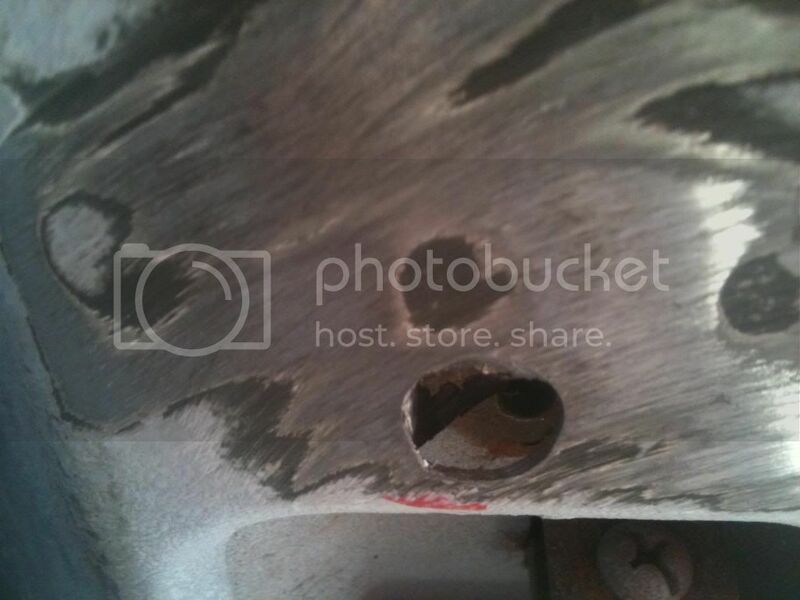 Locate & carefully drill out the spot welds on the triangular shaped inside corner braces making sure that you only drill through the top layer of steel. It's probably not going to just fall apart once drilled & you'll need to do a bit of levering with a big flat blade screw driver to get the cold chisel in there to split the two layers. Try not to bend or damage these braces while you're doing it as they will be reused later. 2. Once you've drilled out the welds & split the two layers in this area on both sides grab your eye/ear protection & angle grinder with a cutting wheel attached & cut through the horizontal brace at the join of the triangle brace being careful not to chop into the roof skin. 3. Next drill out the couple of spot welds that are in the side legs & cut the flap so you can bend it out. 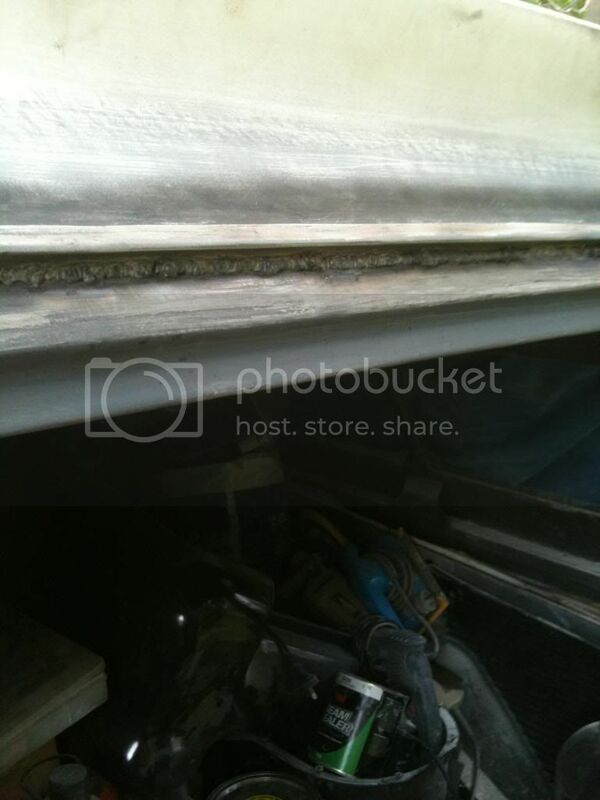 4.Then cut across the under side of the roof gutter from the out side & the whole lot will now come out. Did the first side like this, but found the second side easier buy just cutting through the top part as you see in the next picture. 5. When you've cut everything out, remove the backing from the corner braces. 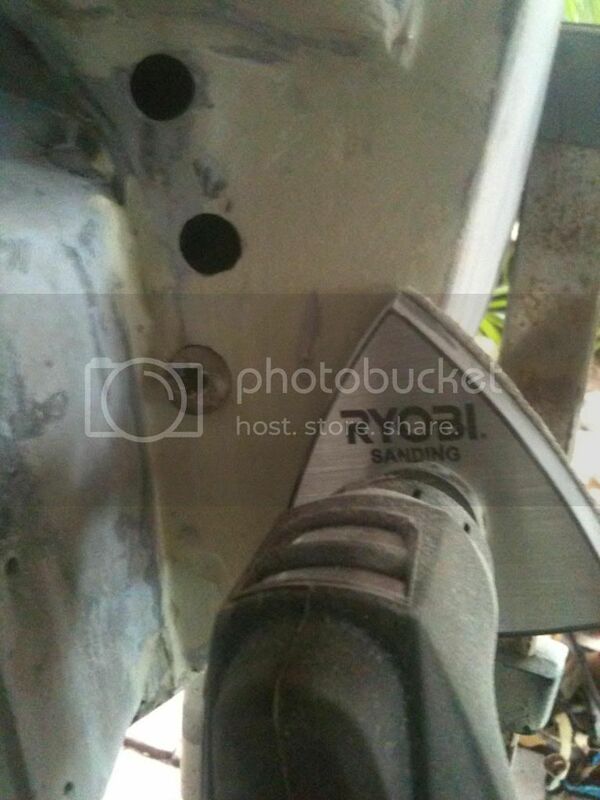 Don't worry about drilling out the spot welds just slice it off with the grinder. The backing needs to come off to fit them back in place later over the top of the hinge brace. 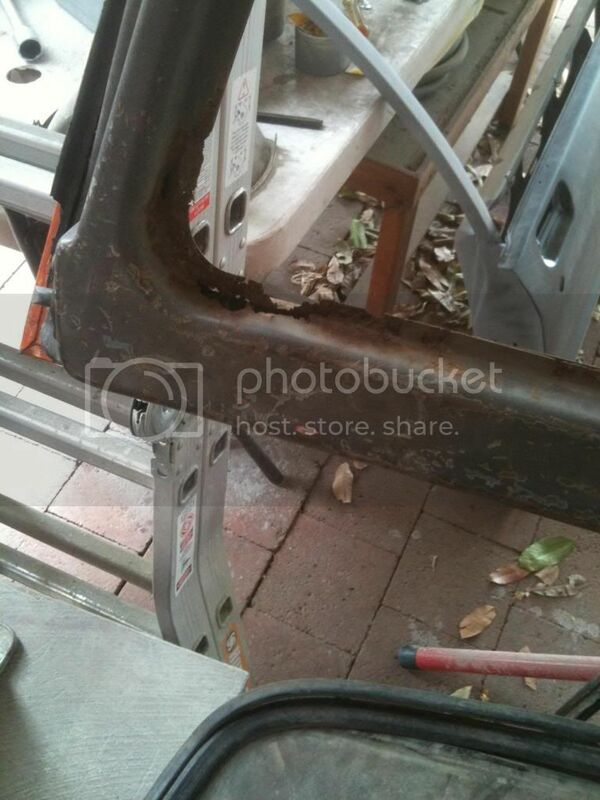 Step 5: Welding In The Roof Brace. 1. 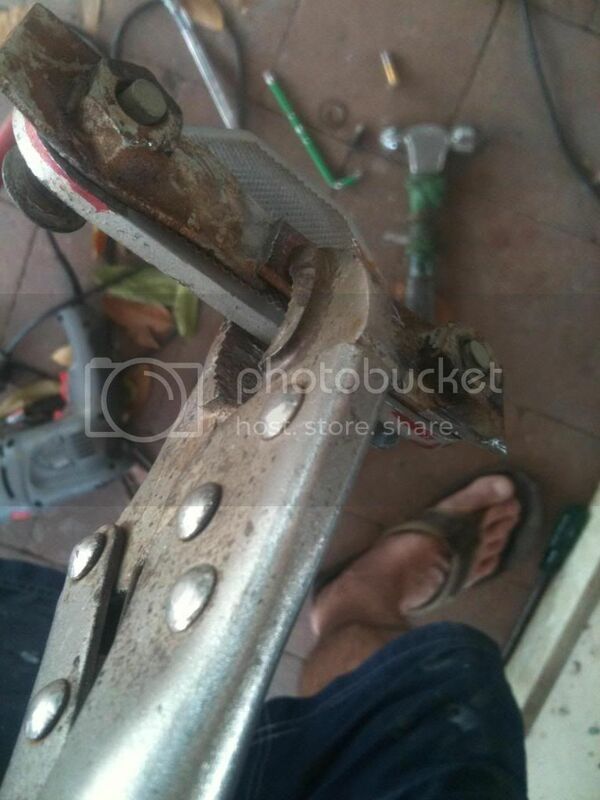 Clamp the brace in place using your vice grips & G clamps. 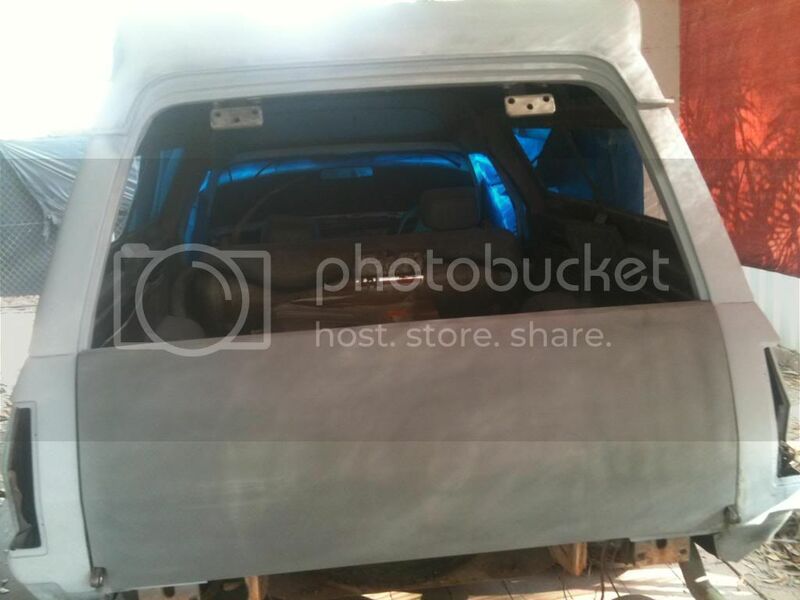 One thing that I forgot to mention earlier, is that you should remove the rear windows or at least cover them up well. Grinding & welding sparks will damage the glass. Believe me, it doesn't seem that trivial but, I've learnt this dumb hard lesson a long time ago and will never do it again. 2. 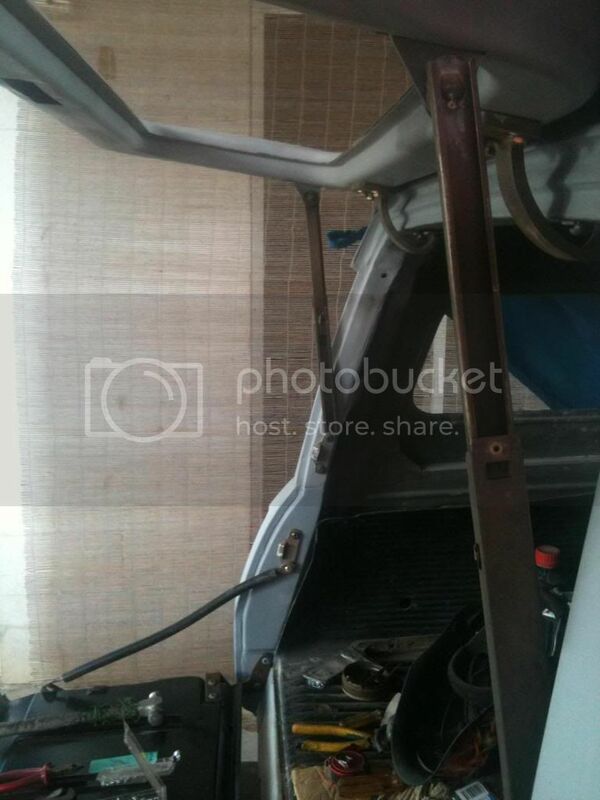 Fire up the MIG, but we are only tacking it in place for now, as we need to do a trial fit of the tailgate before we completely weld the brace in. The gap was slightly tight by a few mm on the right hand side, but close enough as there's quite a bit of adjustment in the hinges mounting holes to allow for it to be corrected. gate in the open position with the brace tacked in. 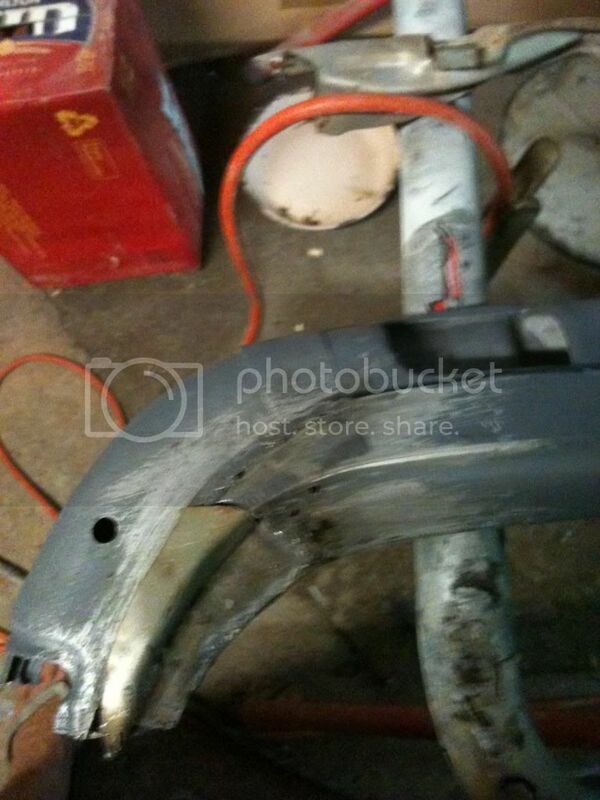 All good remove the tail gate & lets start welding. 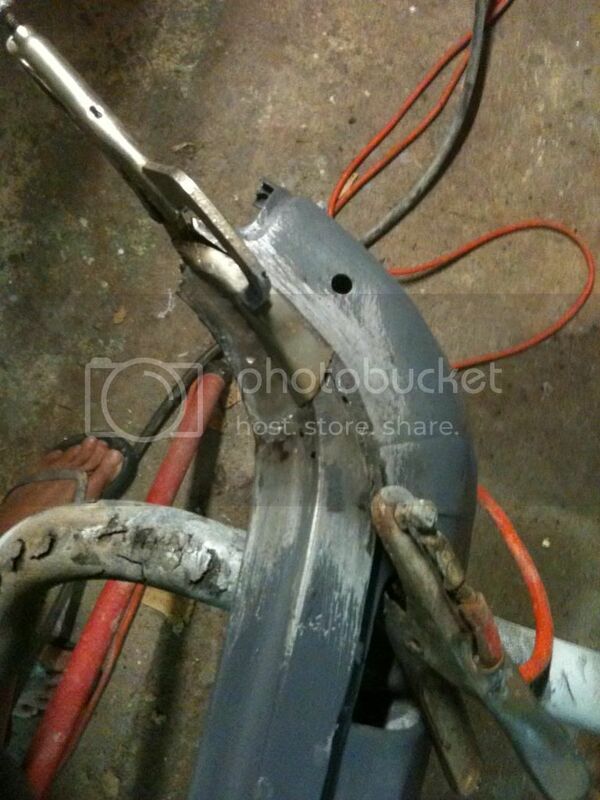 4. â€‹Weld in small sections from side to side working your way towards the middle to reduce the amount of heat input. Cool down with a wet rag as you go if needed. Too much heat will cause distortion. I like to use a sequence of joined tacks to form the complete weld when working on thin or rusty steel to reduce the chance of blow through instead of backing off the amps & not really getting the needed penetration. It doesn't look that great when done with gas less wire but has good penetration & is very strong. We can clean it up with a quick skim off with the grinding disk. 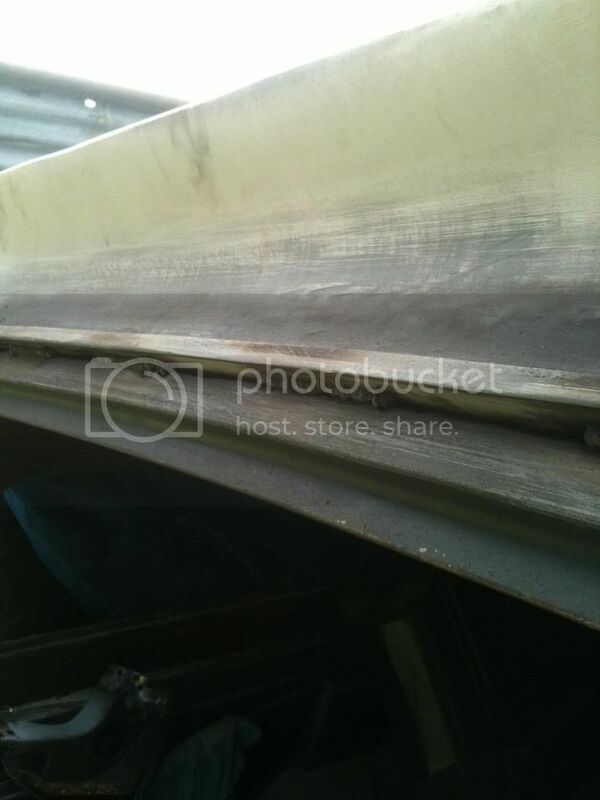 Welding across the gutter is in my opinion, is a better option than welding across the roof skin to prevent heat distortion as it's a lot more solid than the thin roof skin. As you've probably already noticed I've previously fitted the fibre glass roof bobtail, so I really had no option but to do it this way. 5.Once you've welded across the top & joined the side dog legs back together the triangular corner braces can go back in place to strengthen everything. You will need to use you're wide jaw vice grips to clamp them back in place. 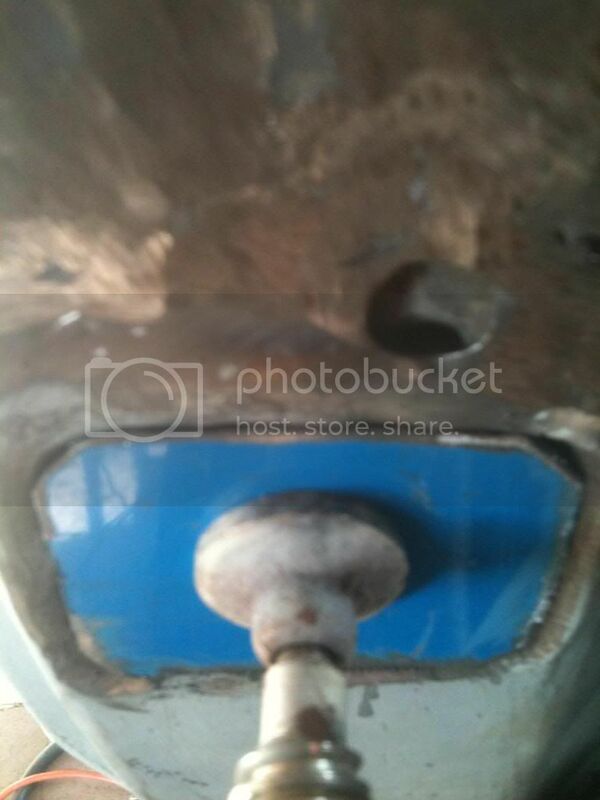 Clamp the brace in place & weld through the spot weld hole until the hole is filled up then grind off smooth. 6. 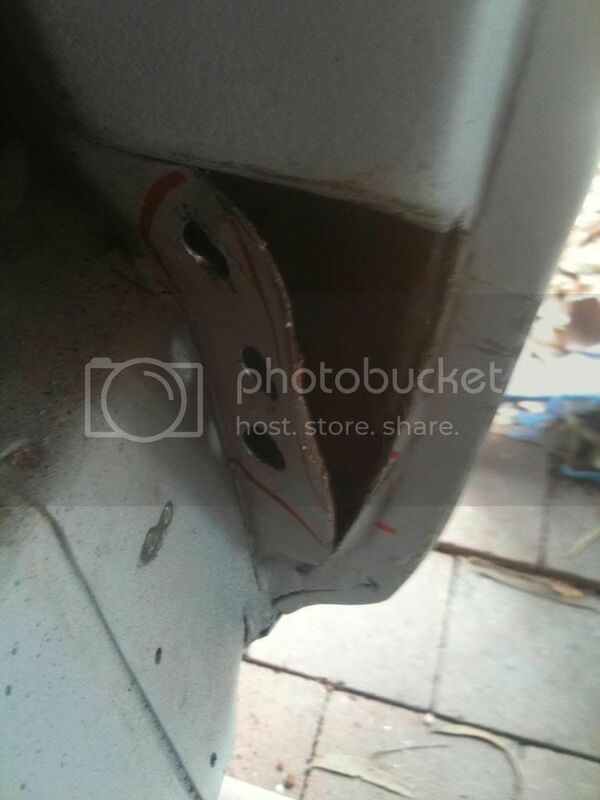 After tacking in place, weld the bottom edge first so it's nice & strong. It needs to be strong at this point as you may need to use a jack between the floor & top edge with a suitable length of timber or similar to push it back up into position to get a tack or two onto it at the roof brace top section. You'll see what I mean. 7. 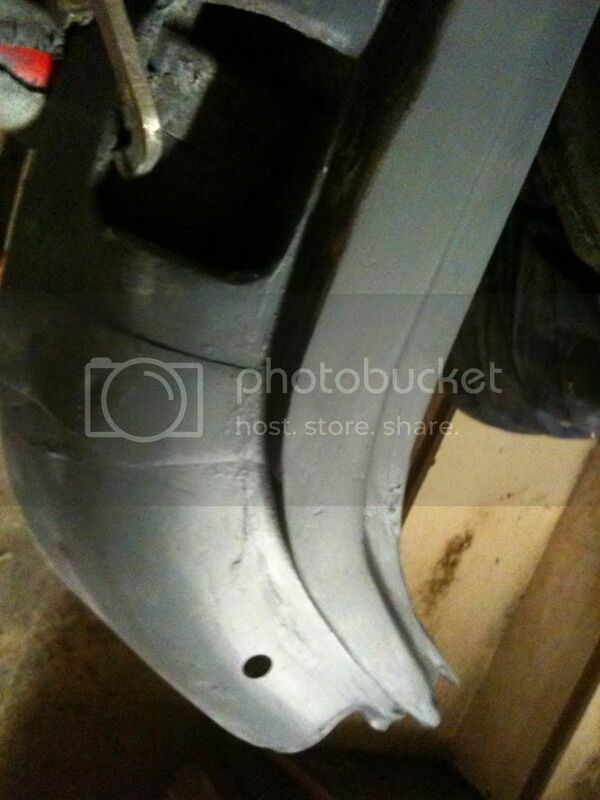 Clean all the welds off with wire brush & turps then etch prime & seal with seam sealer & body deadener..
8. 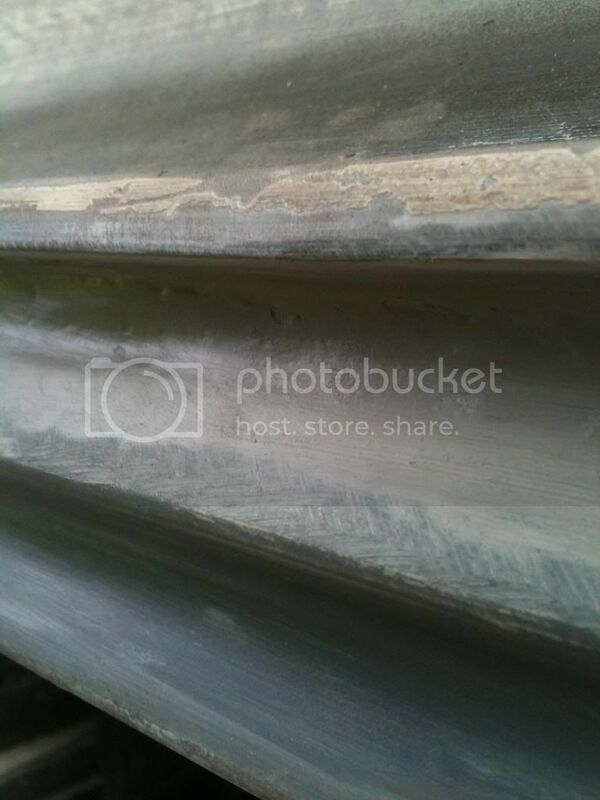 Run a bead of seam sealer with your finger under the gutter once the weld is ground smooth, let the seam sealer cure for a week then you can sand it off so it all looks like one piece. Then a coat of etch primer & spray putty. The seam sealer inside the gutter burnt a bit from the welding heat so i dug it all out & ran a new bead in there as well. 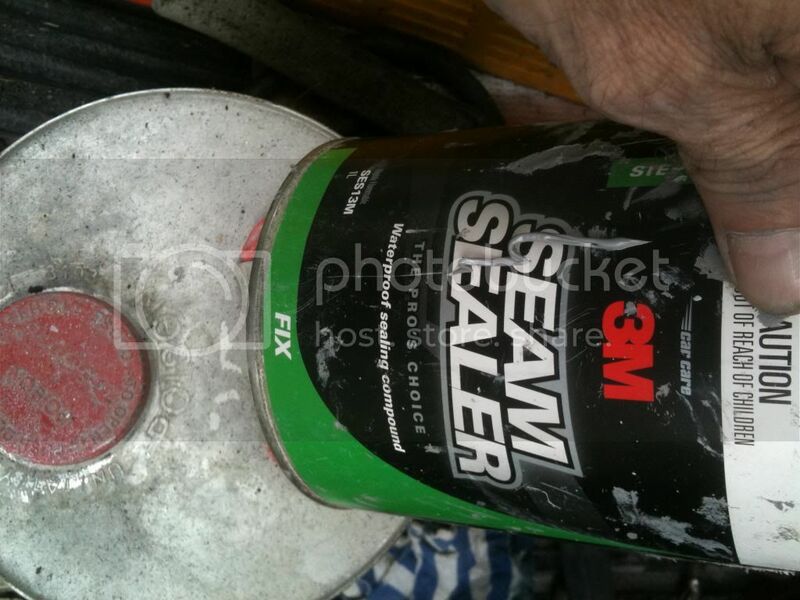 Seam Sealer It skins over pretty quick, try to keep a wet bead as you go, to keep it smooth. I just bead it on with a wet finger.It needs to be run over with either your finger or a ice cream stick or something to press it into any pin holes or cracks. Clean up excess with thinners on a rag. You can also buy this in a corking tube as well. So that's about it for the top section for now. 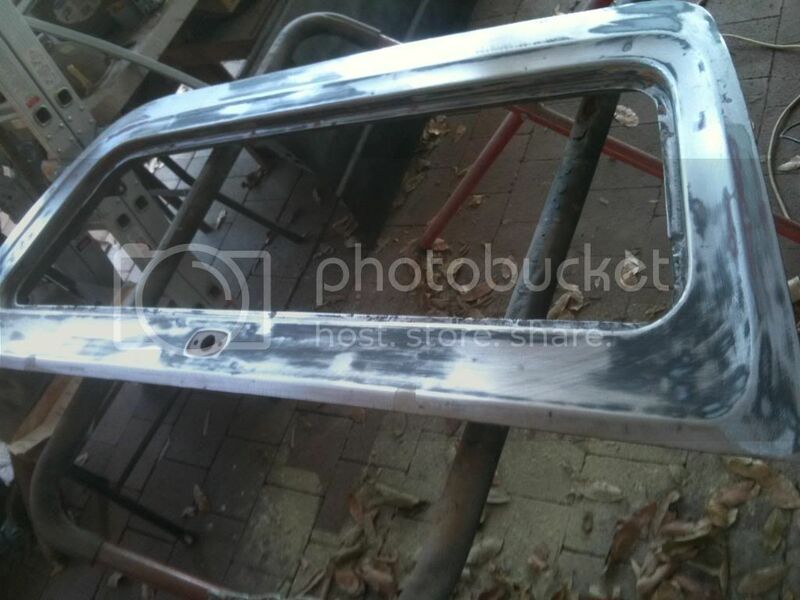 I'll need to go shopping during the week at the wreckers, to try & find a ute that I can cut out the lower hinge braces from & we can start on the bottom tail gate process. So it's been a while since iv'e posted here but don't worry i haven't abandoned the project & it's actually starting to get somewhere near completion. I really hope this has helped someone so far & or inspired someone to give it a crack.If so i'd love to see some pics here of what you've done ! 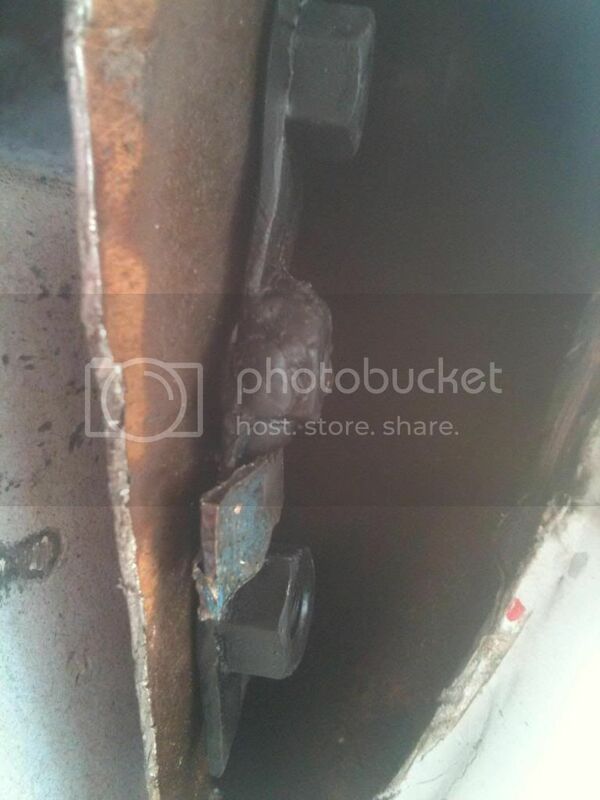 I'll start it off by showing some before & after rust repairs that were needed on the upper door in it's inner corners.
] The door didn't look to bad at first glance but i suspected there was some hidden cancer. Sure enough once i removed the glass & seal i found this, hmm not so good, work required here ! 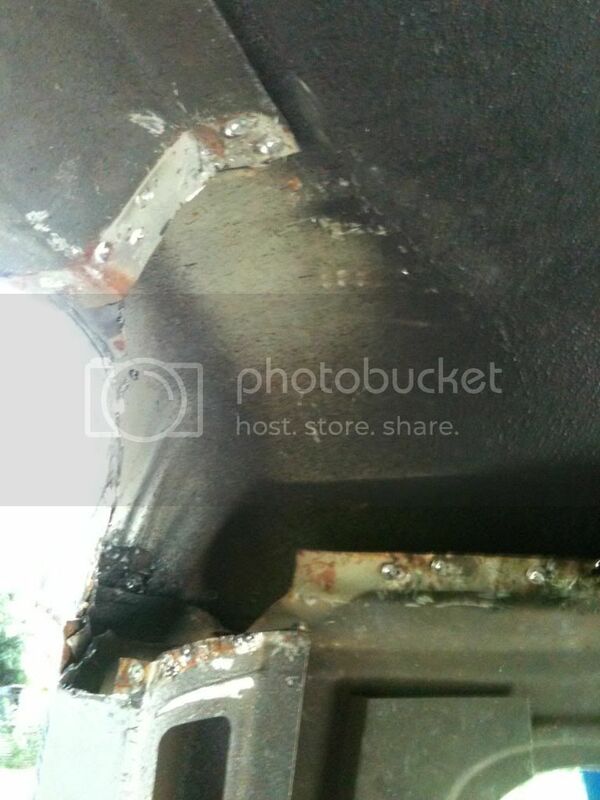 A little trade secret to share with you is, Don't waist your money on expensive rust kill chemicals. You can make your own quite easy with common house hold vinegar & tap water solution & in my opinion it works better & is safer to use. Just mix up white vinegar & water to a 4-1 solution in a bucket. Use some gloves cause it stinks pretty bad on your skin. 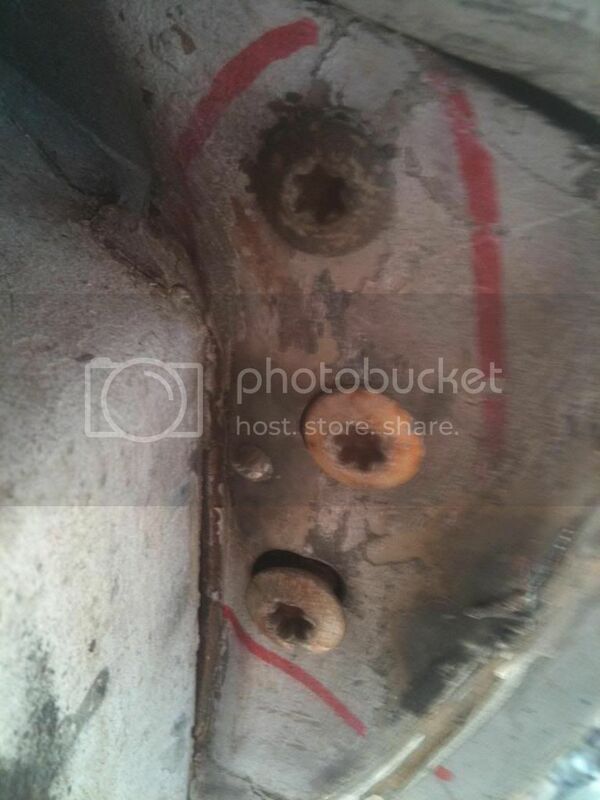 Then once your panel is down to bare metal scrub the hell out of the rusted area with a red (course) Scotch Brite Pad. Let the solution soak in for 10-15 min then scrub & clean all the solution off with clean water. 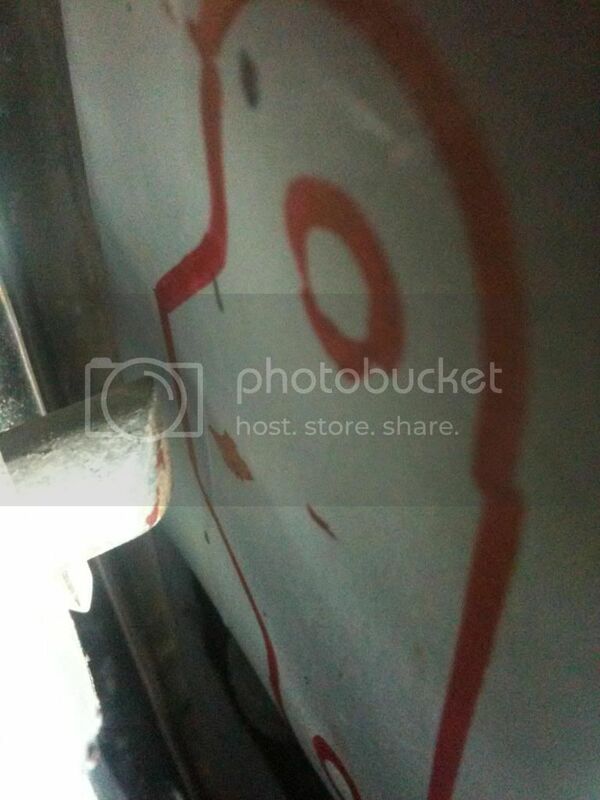 A chemical electrolysis or however/whatever it is that takes place will kill the rust & turn it to a black color, in other words turn it back to metal. Don't make the solution any stronger than 4 parts water too 1 part vinegar & don't leave it too long. Also make sure you clean it all off. 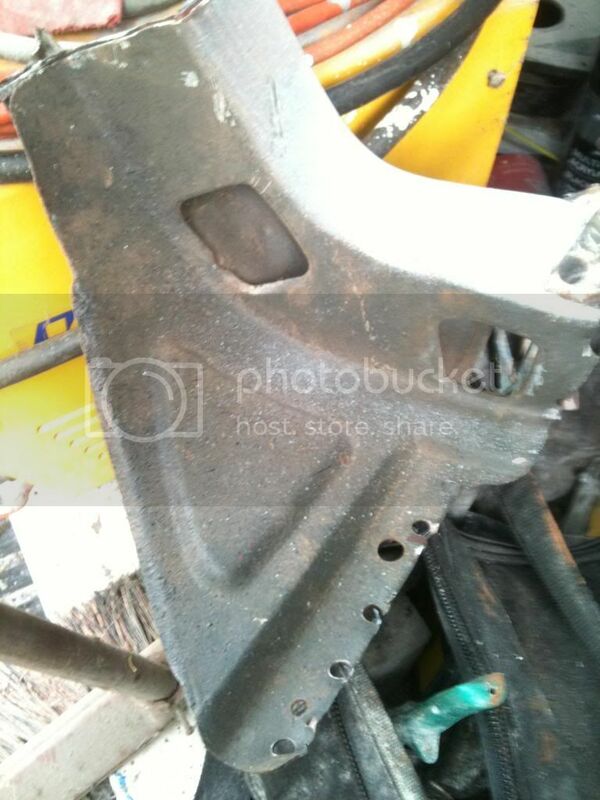 And 'wolar' this after the rust was welded up & etched. 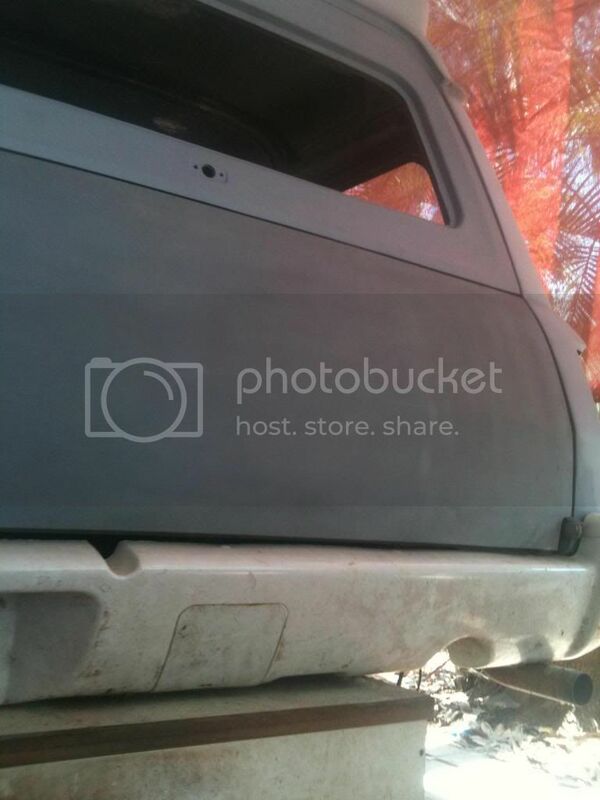 The Bottom Tail Gate Process. 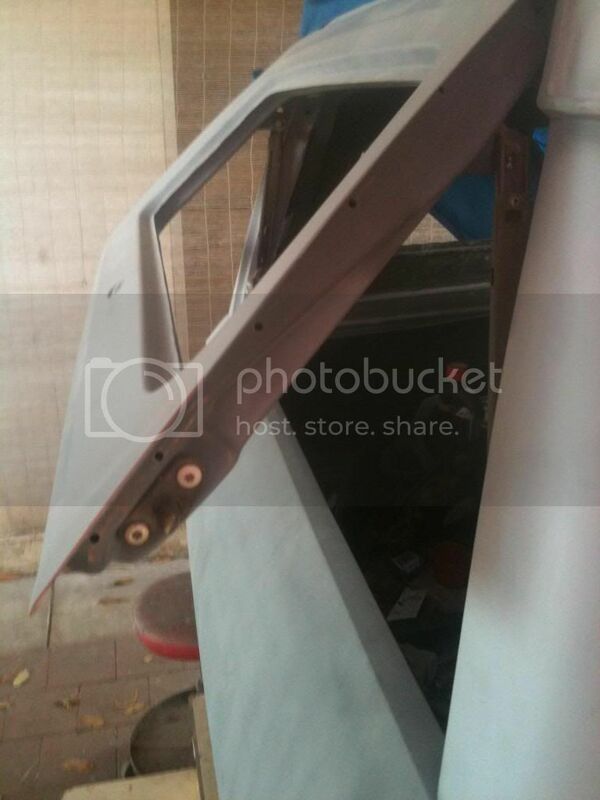 Okay, there's a couple of ways to go about fabricating the bottom tail gate hinge mounting section of the body. 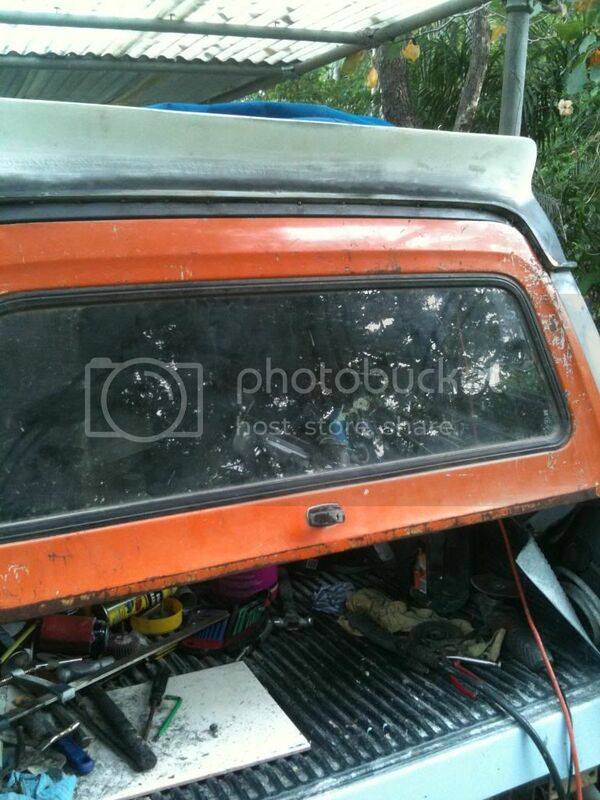 The picture below is what we need to make for our van, to bolt the tail gate hinges & closing brackets to. I've used my XD ute as a reference to measure up the correct positioning of where it all needs to go. 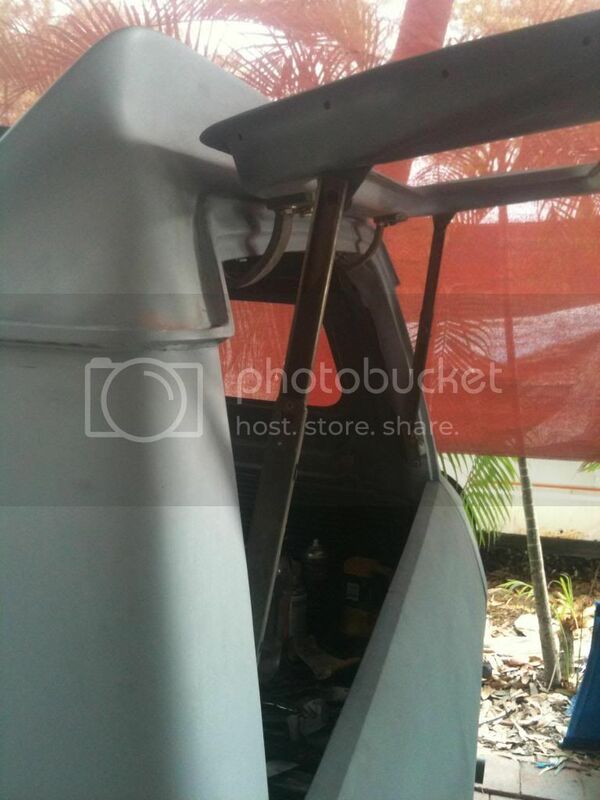 You could carefully cut these whole sections from a ute wreck, if the rest of the body is destined for the crusher. 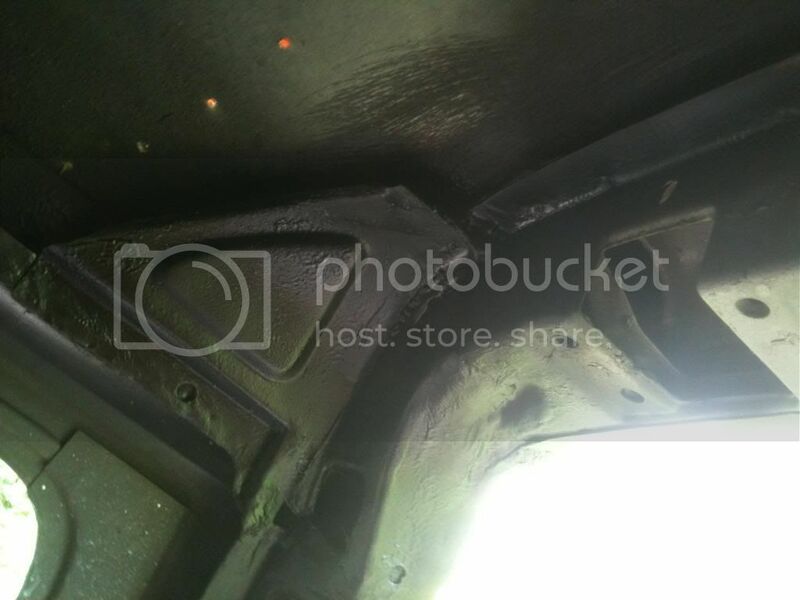 I'v decided to go for the non destructive method & fabricate the internal brackets myself, carefully position the mounting holes, then just open up the existing van panels in the needed area to get the brackets in there. This way there will be a lot less cutting & welding needed. This section of the van needs to be the same as utes. 1. Measure and Mark Out The hinges. 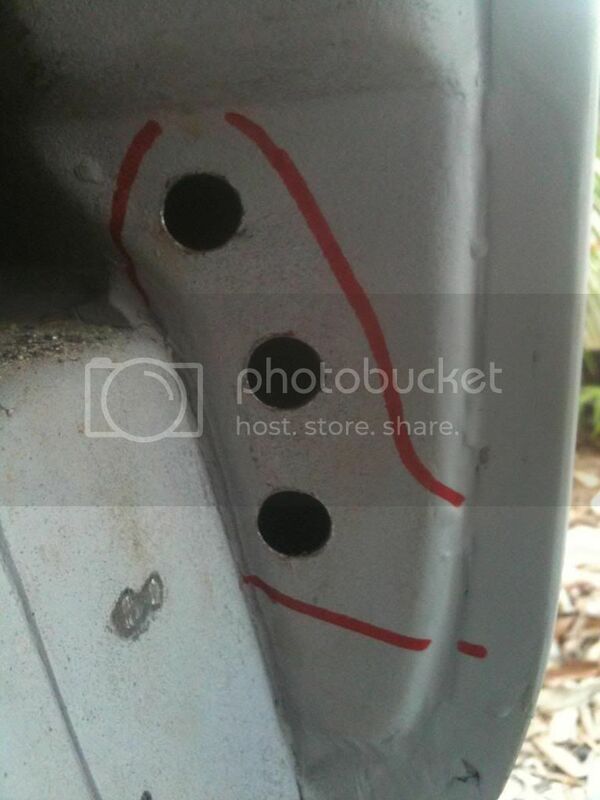 Using a ute as a reference if possible, measure & mark out where the hinges are mounted to the ute & mark the holes around the hinge itself like this. 2. Drill Out The Holes. Punch & pilot the exact centre of where the holes will be, then using a 7/16 bit drill them out. The holes need to be bigger than the bolt size of 5/16 to allow for movement of the internal bracket for adjustment of the hinges. 3. Making The Internal Brackets. Using the internal brackets from your barn doors hinges, cut them in half so you have two pieces with a nutsert at each end. 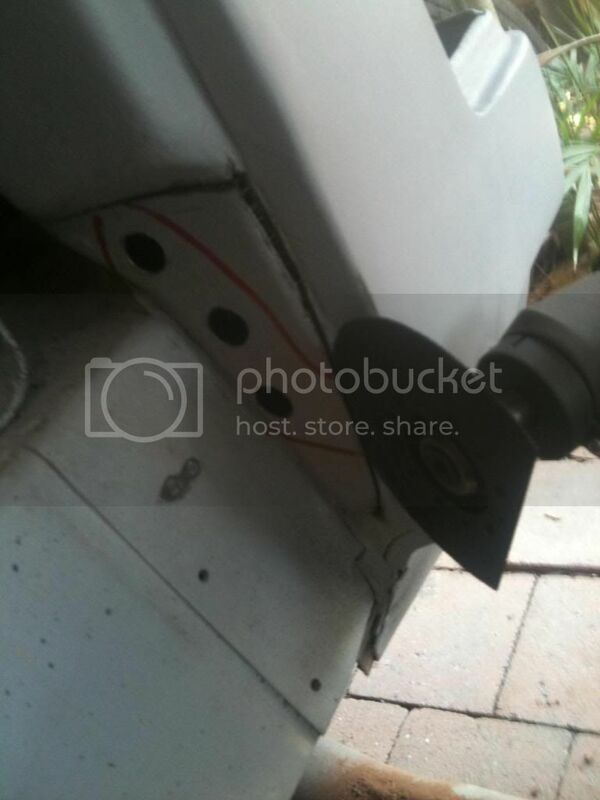 Take your tail gate hinge and bolt the two pieces to the hinge then weld the two pieces together. 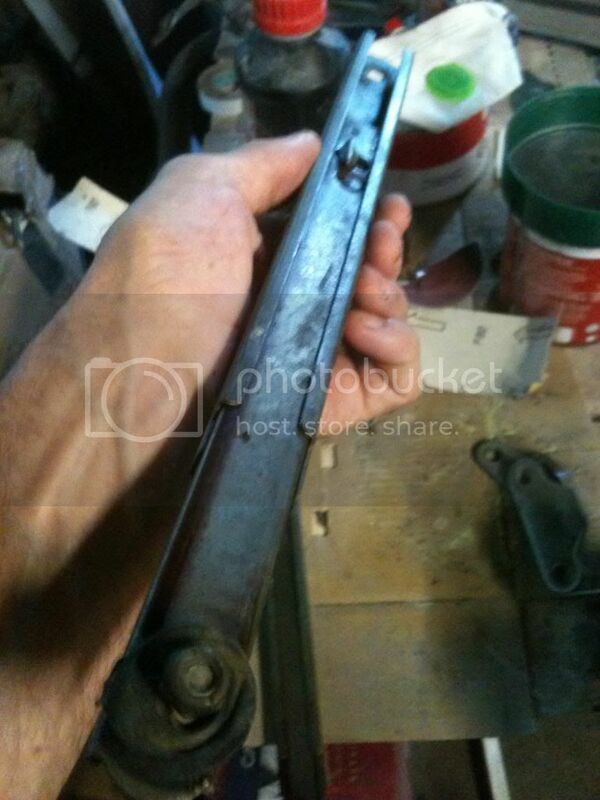 Once you've welded them together unbolt them from the hinge & grind the weld down smooth on both sides. Don't go nuts with your grinder, it needs to be a strong join but smooth. Okay now that you have a strong join & one piece bolt it back on the hinge & drill out the centre hole with your 5/16 bit the same size as the bolt holes in the hinge. Now unbolt the bracket from the hinge again & put one of your 5/16 bolts through the centre hole & screw a nut down to the face of your bracket. 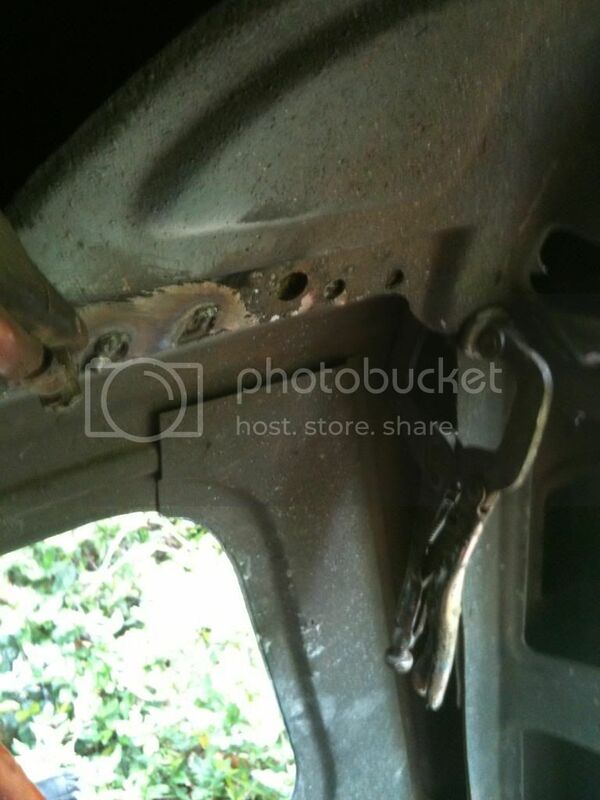 Now weld that nut to the bracket. 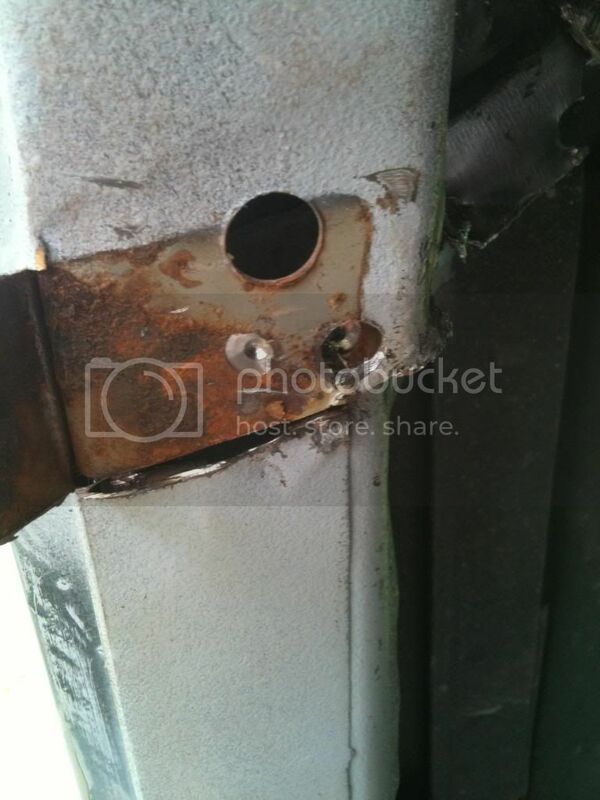 You should now have a bracket with perfectly positioned nuts welded to it to suit the hinge like this one. Give it a coat of paint to prevent it from rusting. 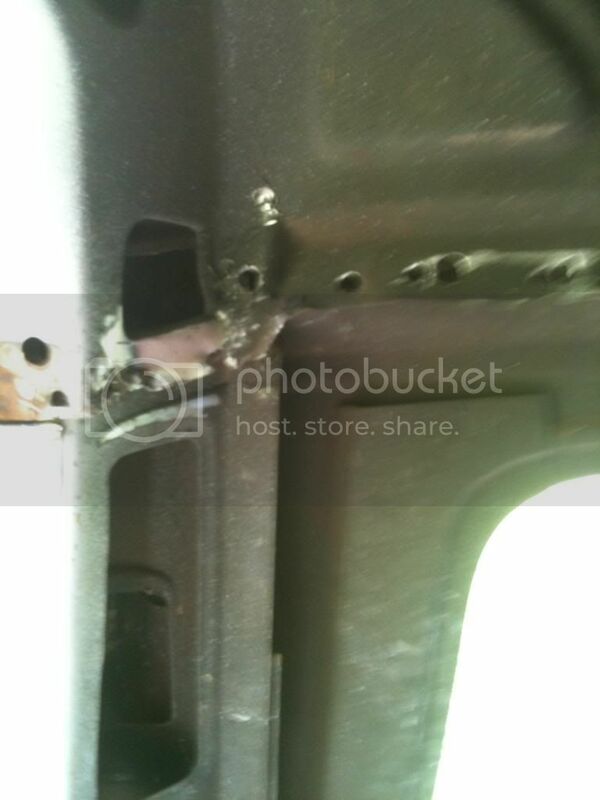 We now need to open up a small section of the panel where the holes have been drilled to get the bracket inside. Make a horizontal cut under the upper section where the profile of the panel widens and a vertical cut down the front part of it. I used one of those cordless multi tools, this thing is awesome it cuts sheet metal and panel steel with ease. It's a bit noisy but no more than a grinder, but no sparks and a finer cut than a 1mm cutting disk on the grinder. You can also cut shapes, sand and grind using the different blades it came with. Cut the front vertical part on a angle like in the picture because there is a section of steel behind it that we don't really want to cut into. Once cut, lever the flap back you just made to open it up an inch or so like this. Put your bracket in and hold it in place with the three bolts. 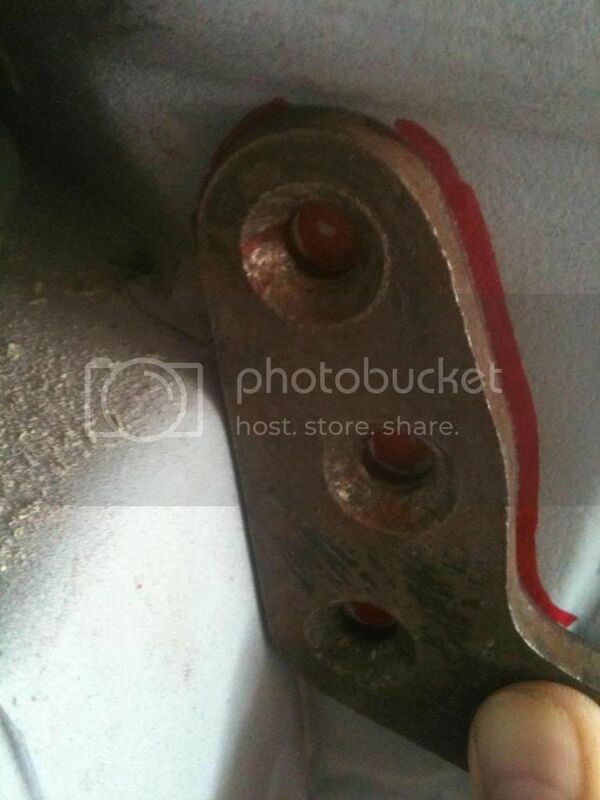 Then weld a tag across the bracket between the nuts to hold it in place when the bolts are removed. 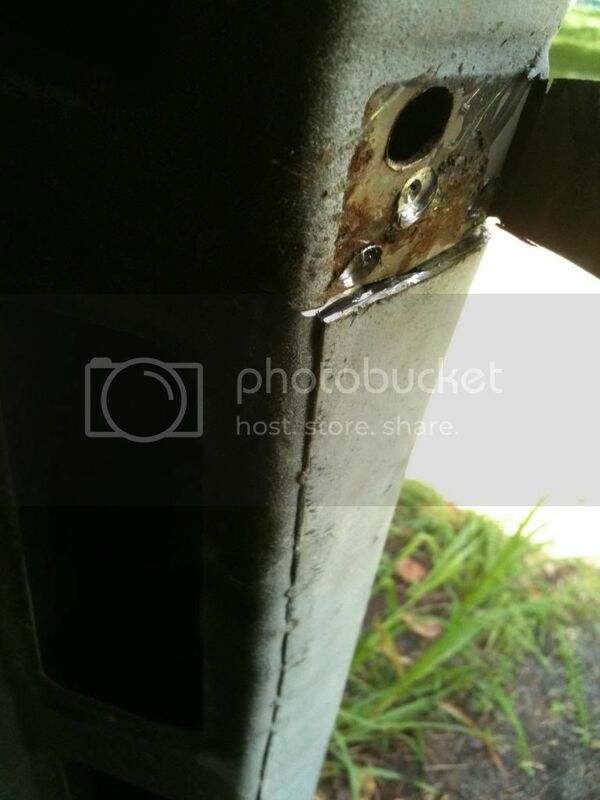 Don't weld the bracket to the flap. The purpose of the holding tag is so there is movement of the bracket for adjustment of the hinges with the over sized holes we drilled in the flap earlier. Remember how the square brackets were held in for the barn doors hinges, same or similar thing going on here now. 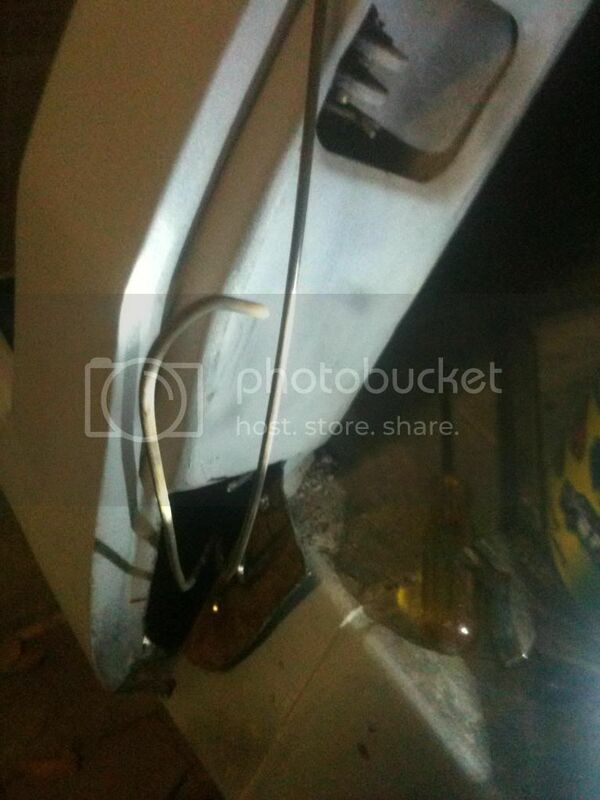 Once the bracket is in place and moves around freely bend the flap back into place so it's ready to weld closed. 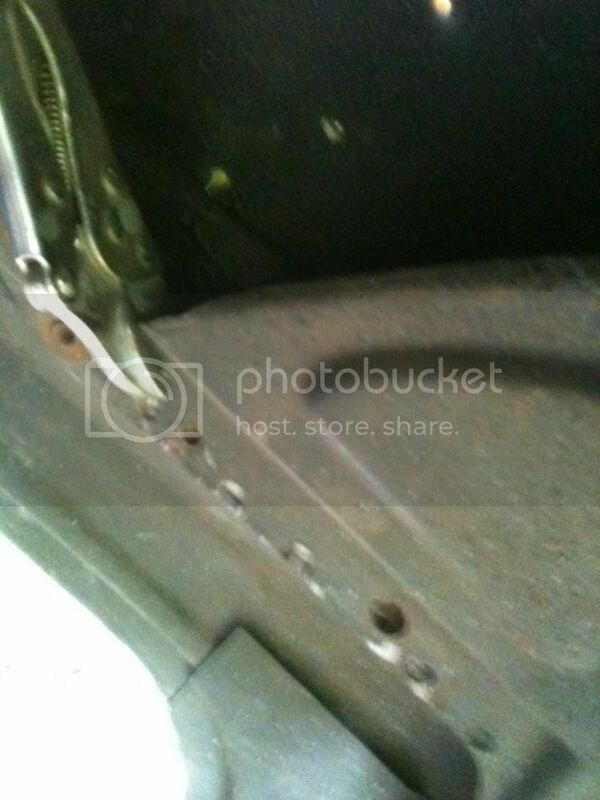 Weld her up and grind the welds of smooth then give the hinge a trial fit. Any bare metal that has been left for more than a few hours or over night, or is going to be left for any length of time before you get a chance to prime it should always be deoxidised before you go any further with bog paint or anything. 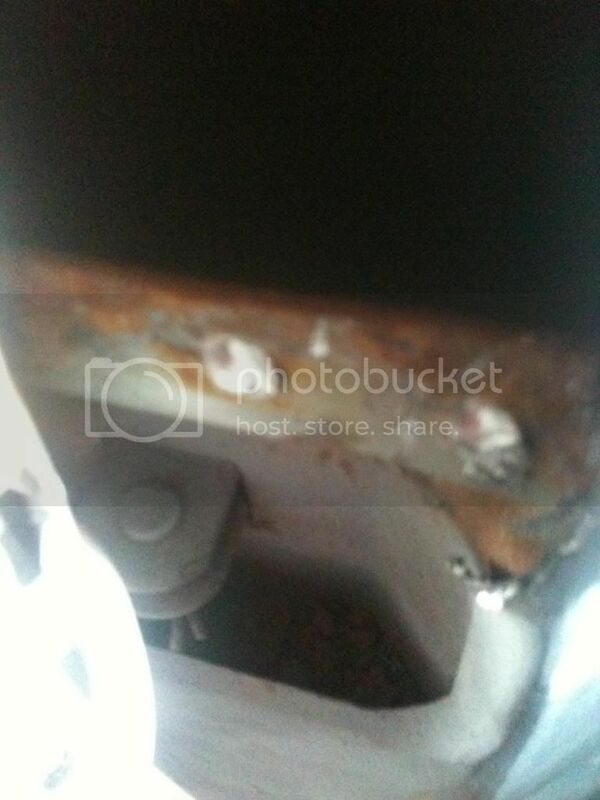 You may not see any contamination but the metal has actually started to oxidise already, this is the first part of the surface rust process that will take place. 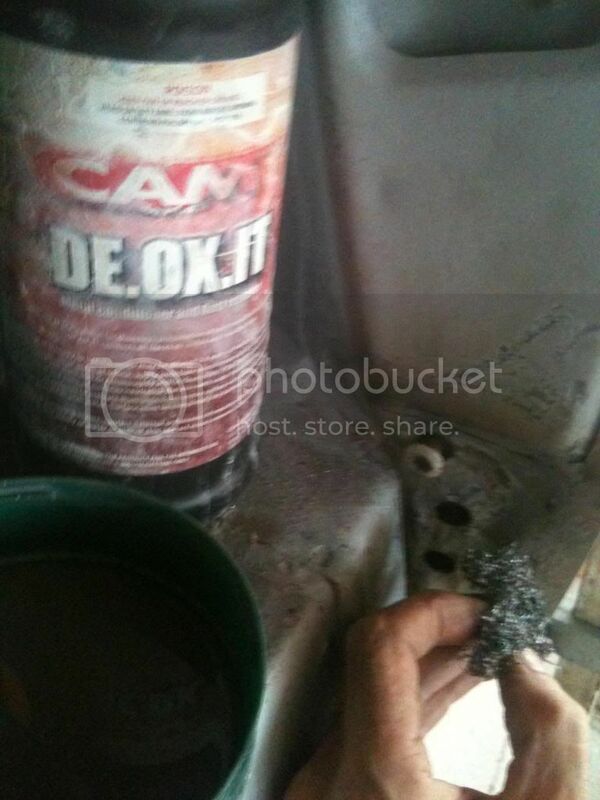 The Deox-it cleans and 'blues' the metal. The same as the vinegar kill rust solution, scrub the steel with a scour then leave it to activate before cleaning it all off with clean water. Give the surface a fine skim of bog and sand it off so it's all nice and smooth. The multi tool came in handy again here to sand into the tight corners. Check out this surprise I found when I opened up the left hand side. 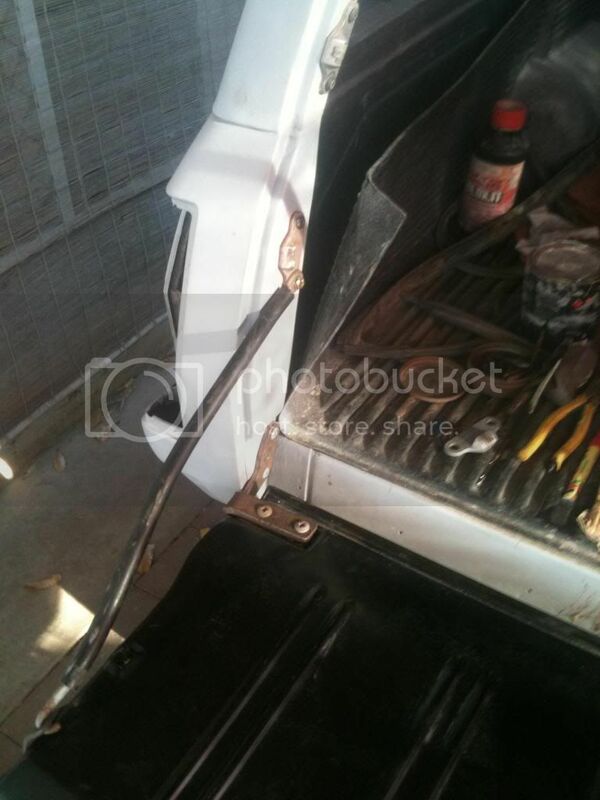 Ford has left a couple of brazing rods in there still welded to the bottom corner of the panel. So that's what that bloody rattle in the back has been for the last 20 years. LOL. I hope the bloke who did this 20 years ago is reading this and remembers doing it , Shame on you ! . 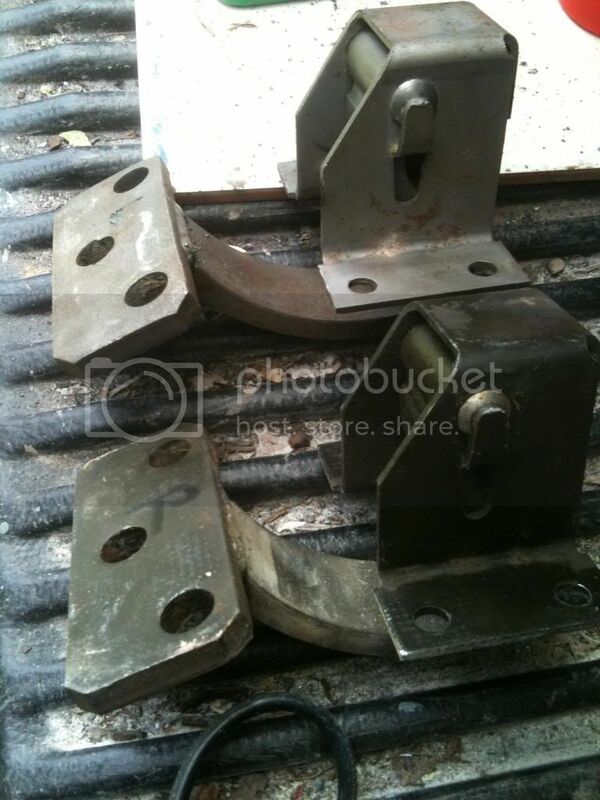 The Closing Striker Plate Brackets. 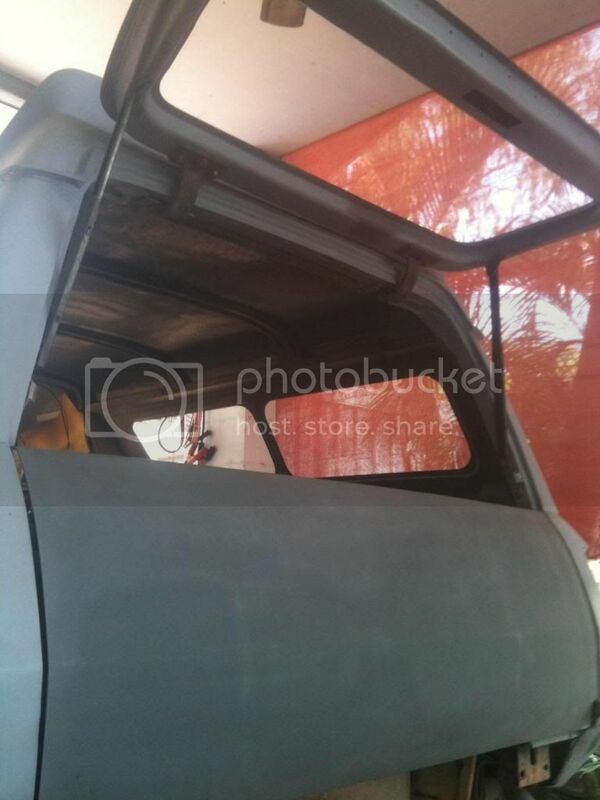 Once the tail gate hinges are done and you have given your tail gate a trial fit & all seems to be fitting well and opening & closing without any binding or problems, you should be getting excited like I was LOL.. The next thing we can do is patch the old barn door hinge mounting holes & fit some closing brackets for both the top & bottom tail gates. 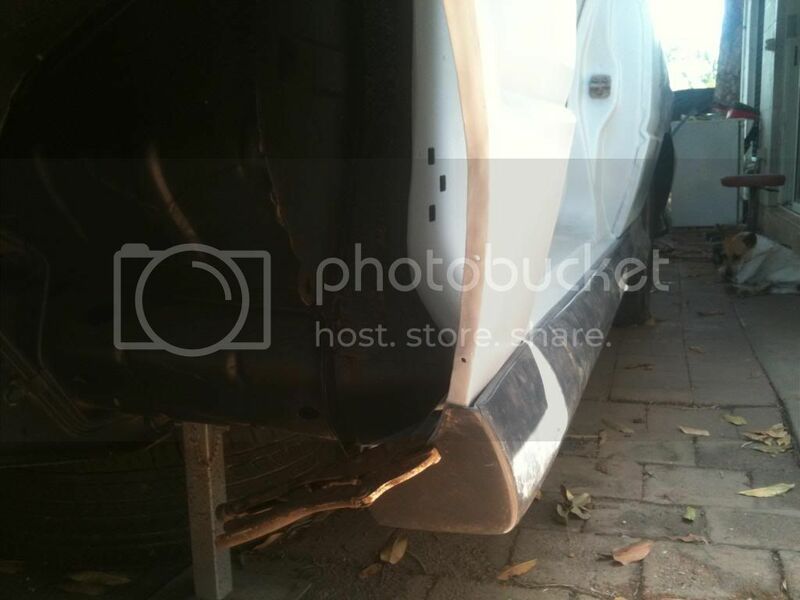 With the tail gate in the closed position and with the locking mechanism installed, stick your head inside to see where the tongues on either side of the tail gate mechanism meets up with the side pillars and mark the pillar with the striker plate in place. 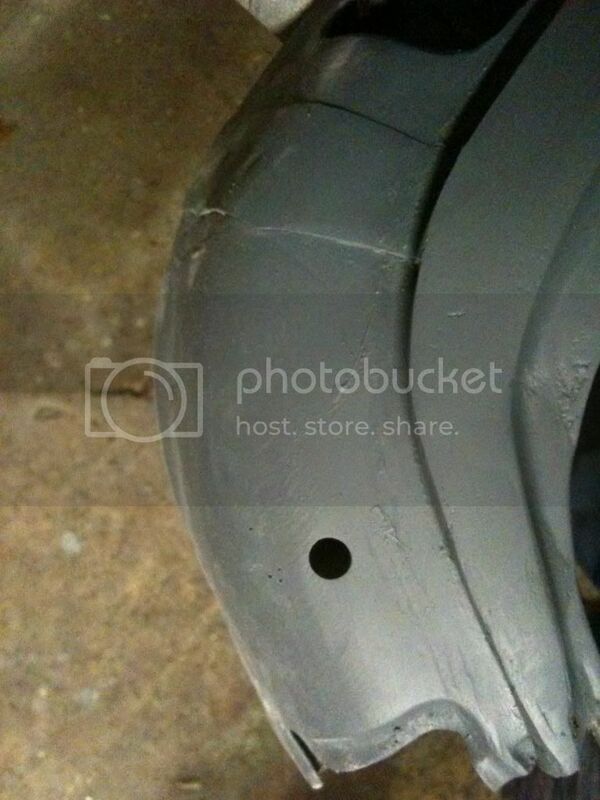 Drill the holes once you're certain it's positioned correctly with the 7/16 bit to allow for adjustment of the plates. There is three spot welds across the top of the opening we now need to drill out, sand the area back and you will see them. 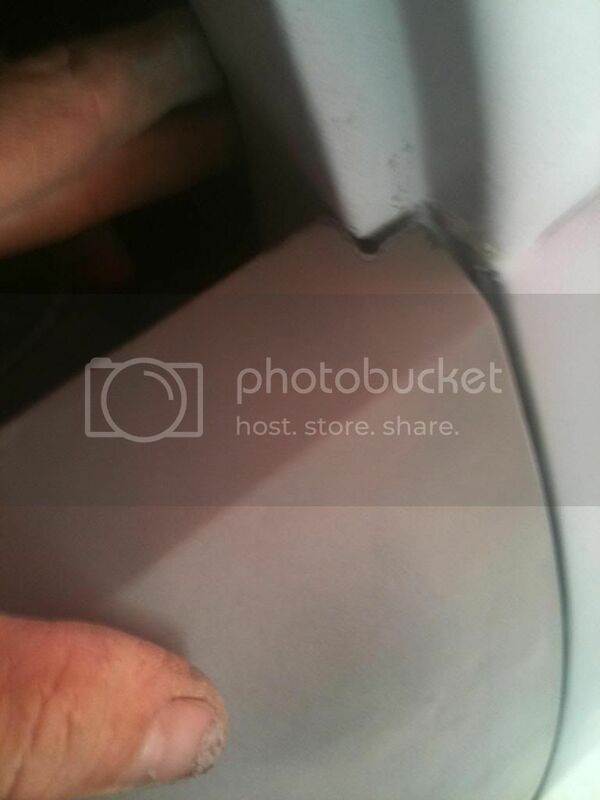 Once you have the flap opened up you will need to cut out this part to allow enough room for the internal bracket. Make up a 2 more brackets by clamping the 2 halves to the striker plate with the bolts in place to position the nutserts correctly and weld it up. 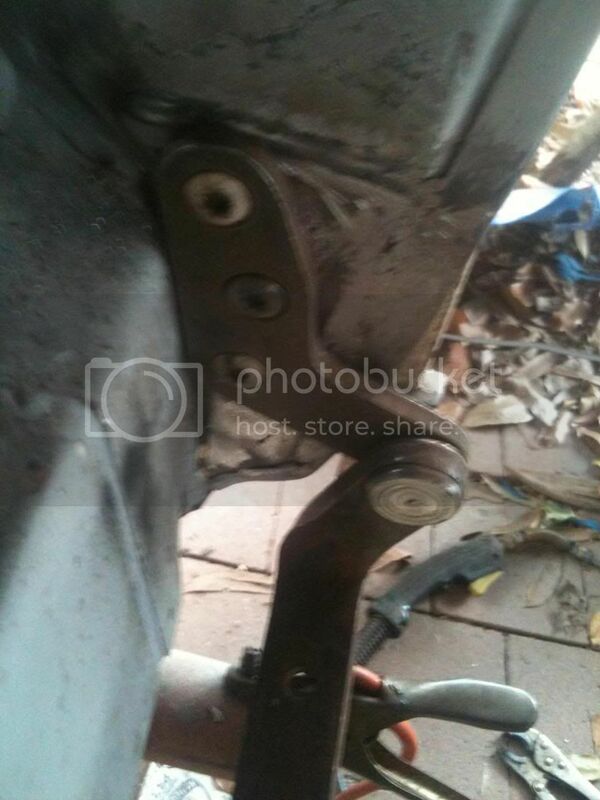 Obviously these brackets only need 2 nuts not 3 like the hinge ones . We also need some bracket holding tags in here too. 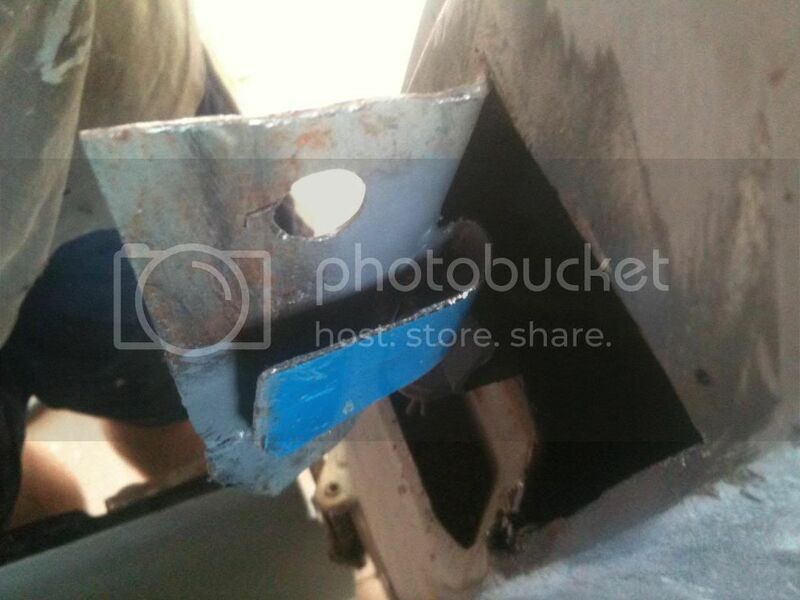 Now we can weld the flap shut and patch the old barn door hinge mounting area. 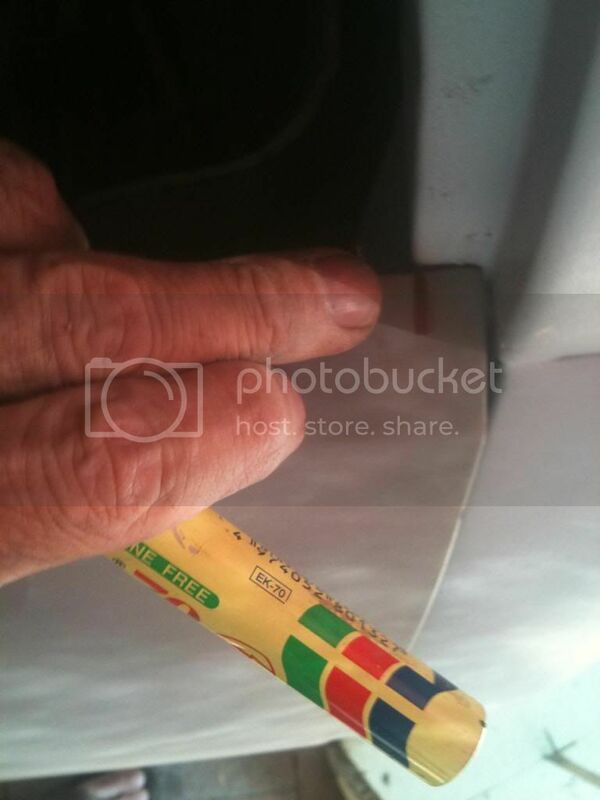 Measure the hole up, I think for memory it was about 50mm by 60mm, but don't quote me on that do your own measurements. Cut a patch that is slightly small & recessed into the area, and hold it in place with a clamp from inside the tail light opening to get it tacked there. Then weld her up and grind off. 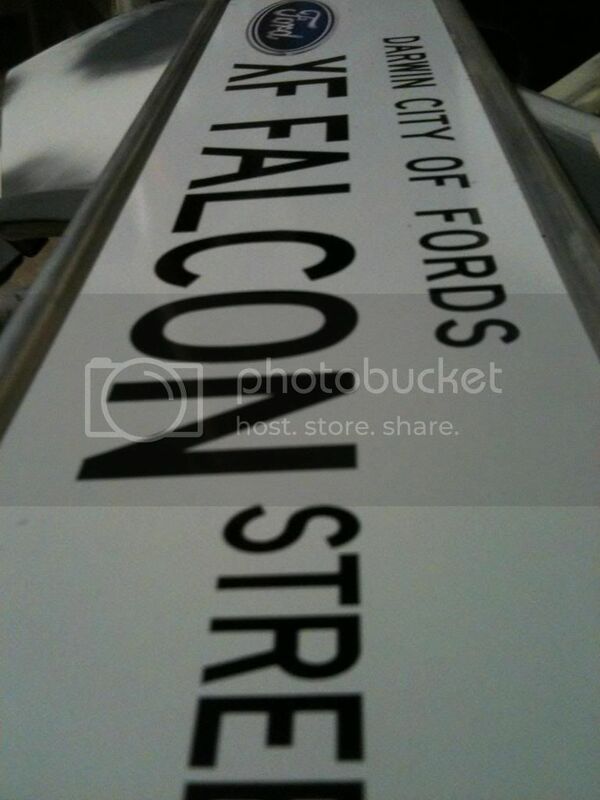 The Top Tail Gate Striker Plates. This is pretty simple and easy. 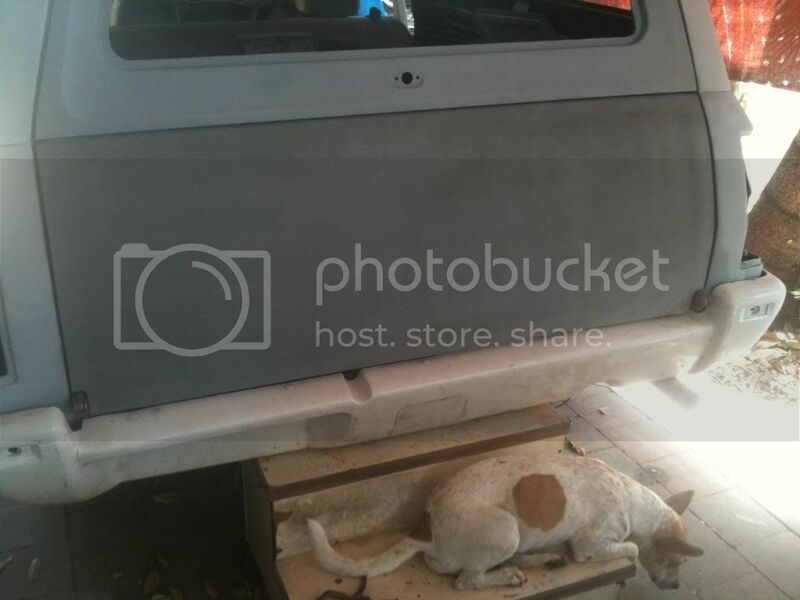 With the top tail gate fitted and with the locking mechanism installed, have a look from the inside like before with the bottom tail gate to see the position of the locking tongues and mark out where the plate will go. 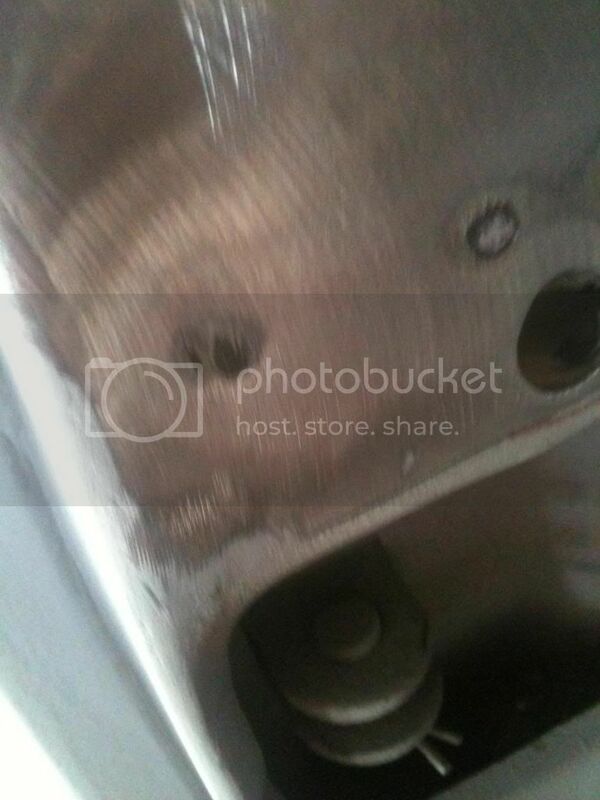 Drill the 2 holes out using your 7/16 drill bit again allowing for adjustment of the plate in the over sized holes. 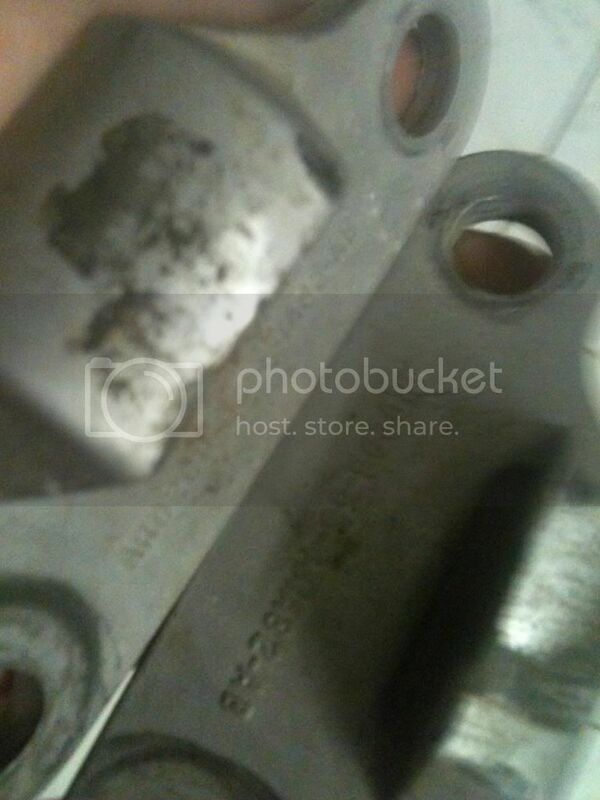 There's no need to make internal fixing brackets on these we can just simply use the 5/16 high tensile torx bolts with large washers and either nylock nuts or spring washers to make sure they won't come loose. No cutting flaps open here, just use the hole on the inside of the pillar to access the nuts with a 1/2 inch ring spanner to tighten them. Time to fit some struts to the top tail gate so it can hold itself open without the old broomstick and some bottom tail gate limit cables so you don't drop your new tail gate on the towbar. I highly recommend using these cables on your tail gate. 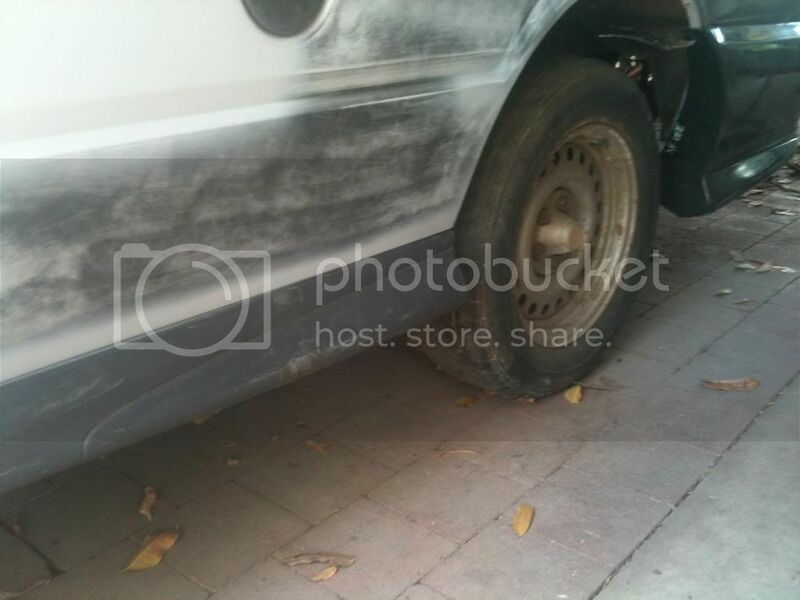 Dented tail gates is an all too common ugly sight on these vans and utes because of where the towbar height is. 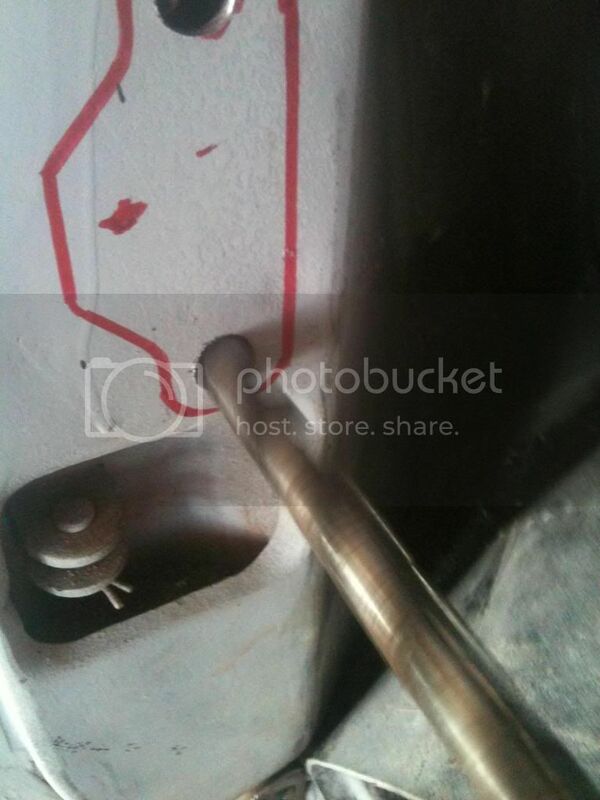 Mount the bottom of the strut as close as possible just above the top of the striker plate. The height & position isn't that critical, just make it central of the pillar & make sure there will be enough room for it to pivot without hitting the striker plate. 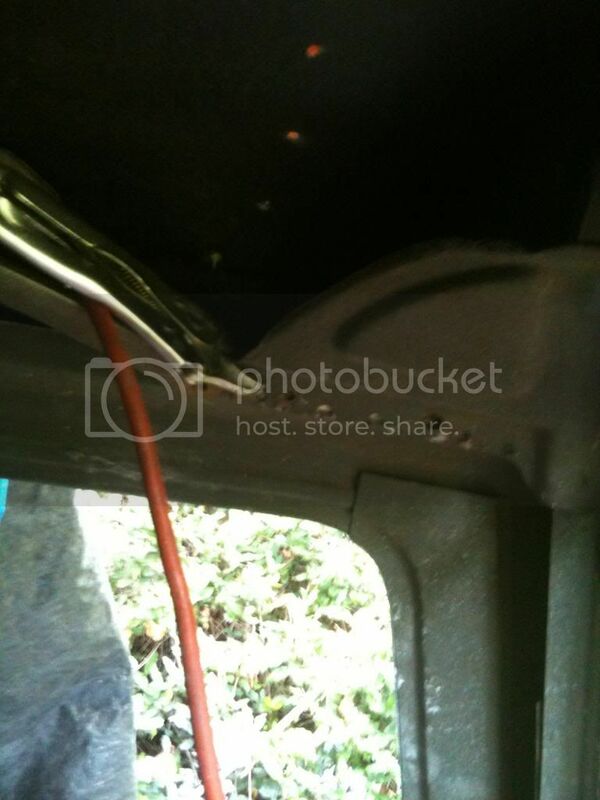 You can use gas struts like for your bonnet if you weren't able to find the mechanical type struts in your parts hunt. I think I like the mechanical type struts with the feature of being able to lock the top tail gate in the 1/4 open position as well as the 'fully sic open" position for cruising at night and hearing that V8 exhaust rumble and smelling those poisonous fumes wofting through the cabin. LOL One of the things I've always loved most about panel vans ! 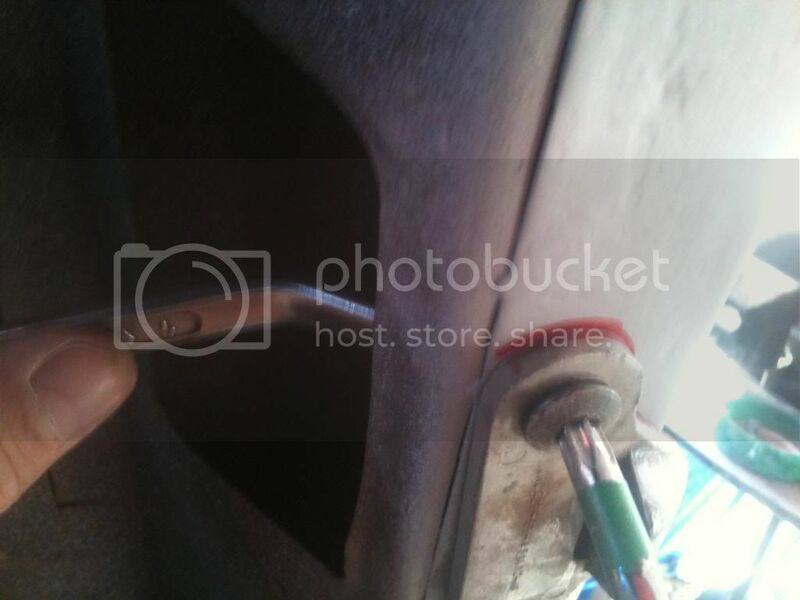 For the bottom tail gate limit cables just use the bottom bolt of the striker plate and the other end hooks into the bracket on the tail gate. Well we're pretty much done now so it's time to clean up the mess you've made so the missus still loves you. I'll wrap it up with a few more pics I've taken of the finished product. 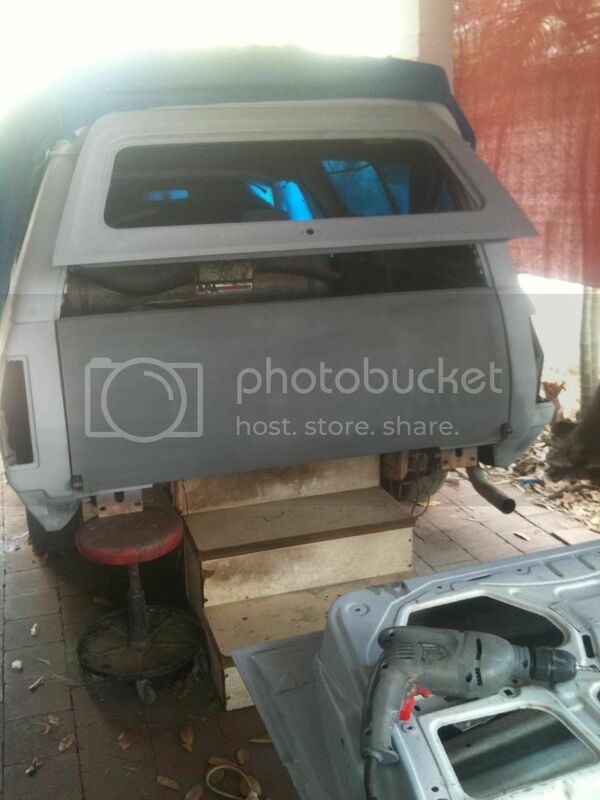 I'll also keep you guy's updated with the progress of my build once I start the painting process. I haven't really decided on a colour yet but there are a few I do like. 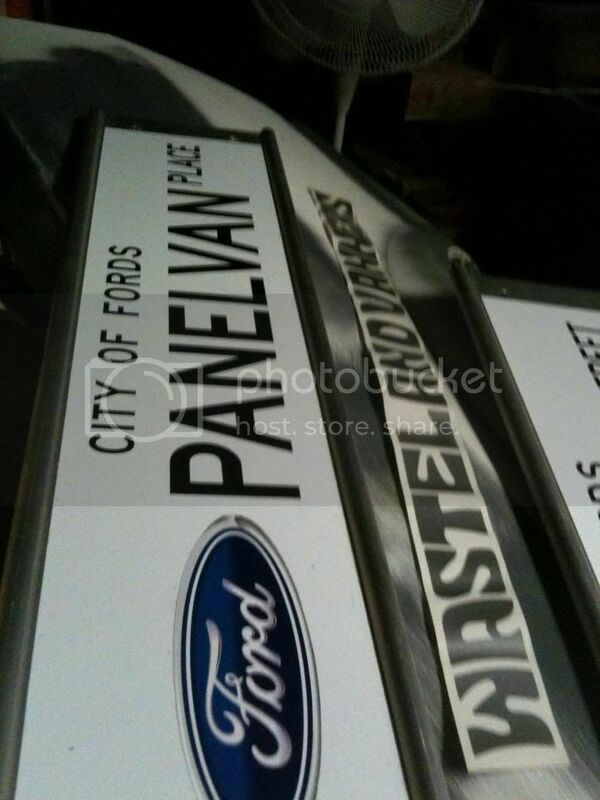 Ford panel vans as we all know are traditionally appliance white. So to keep her sort of 'traditional' but not be so boring, I'm leaning towards a Subaru colour that I reckon is an awesome colour. It's called Satin Pearl White I think and is a colour of the late model WRX's Impreza's & so on. Not sure if any of you have seen these pearl white Subaru's but they really stand out as something special with the right angle of sun on them & would look even better on a Ford IMO. Who knows, the day I go & buy the paint it could end up being anything, other than pink. Bud........start your own factory ! Amazing stuff. Again a quick thankyou, to you guy's that helped me with this conversion with parts, tips on how to go about it, & letting me have a look at your original lift gate vans, (Johno ) to see how it should look. 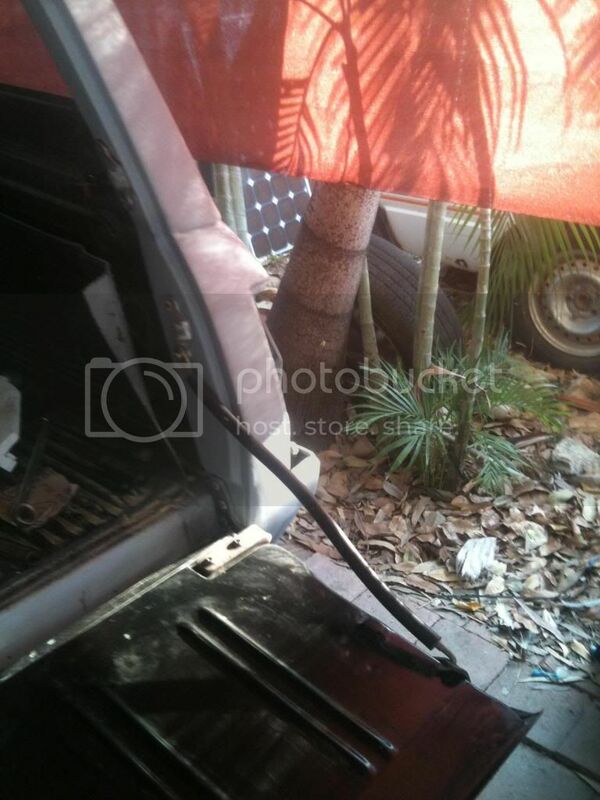 Living in Darwin this wasn't easy finding someone with an original lift gate van to have a look at. In my 25 or so years of living here, I've only ever seen one of them recently that had WA plates on it. It was a beige colour, stock standard looking XF van & probably driven by someone just passing through. I gave the driver the thumbs up, He had the biggest smile on his face, & gave me the thumbs up back, & knew exactly why I was giving him the .It was a special day in my life LOL. 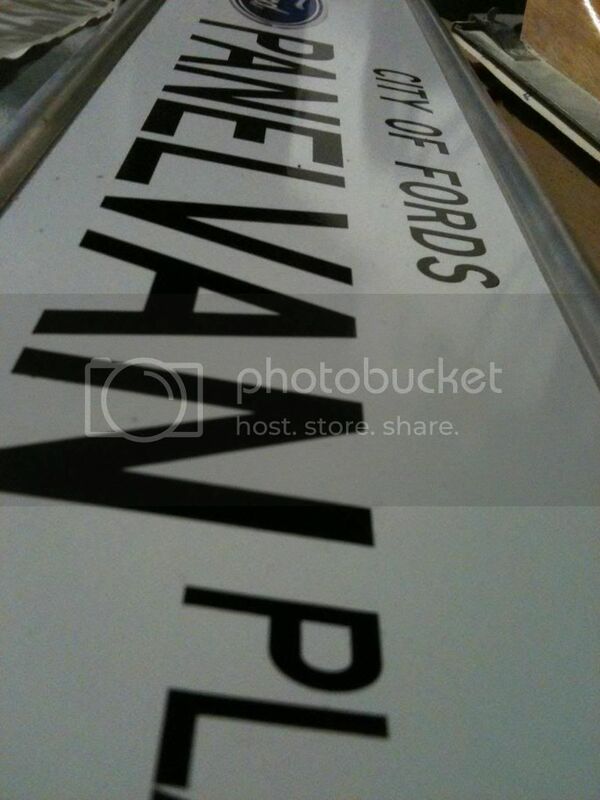 I wish I could have had the chance to talk to him about his van but we were both on the move. Thanks also, to everyone that has taken the time & interest to read this thread, & I really hope I have inspired someone to give it go. 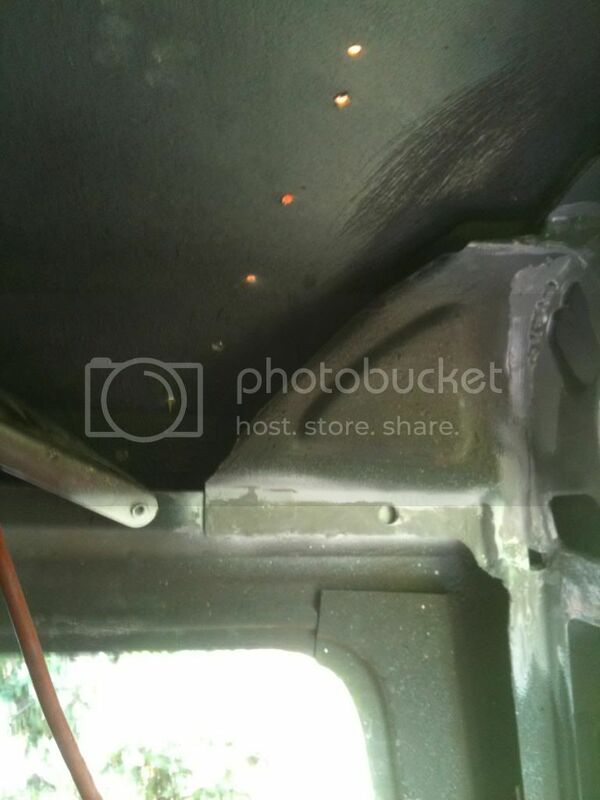 I'd love to get some feedback from anyone that has done it before to their van, that has some different ways to go about it, cause in no way am I saying that my way is the only right way to do it, it was just the easiest way I found, as I progressed through it. Also if anyone doing this need some advice or guidance, I'm more that happy to try to answer any questions you throw at me. 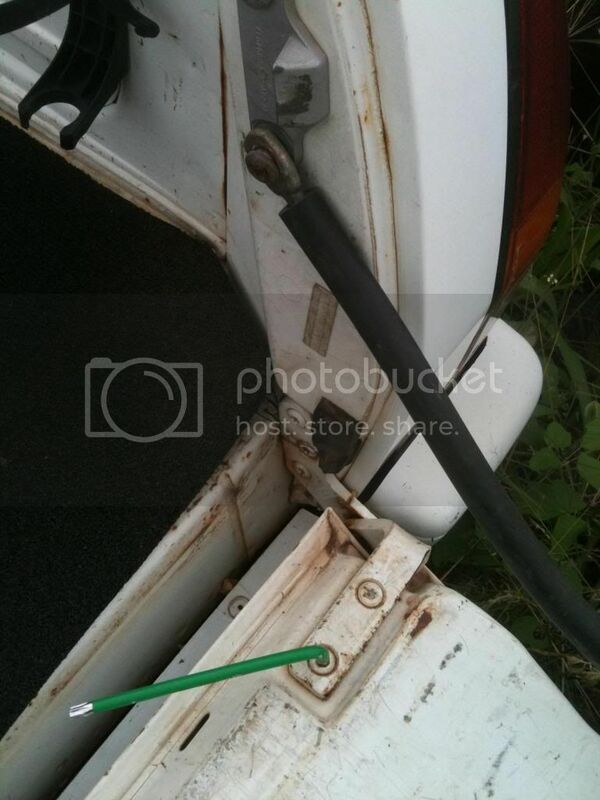 You'll need to notch out the corner of the tail gate like this to allow it to close properly. 'God dam' my fingers look like they're older than this van. 'OH' hang on, um they are ! XH bumper look with my mate Melaleuca checking out something ?? 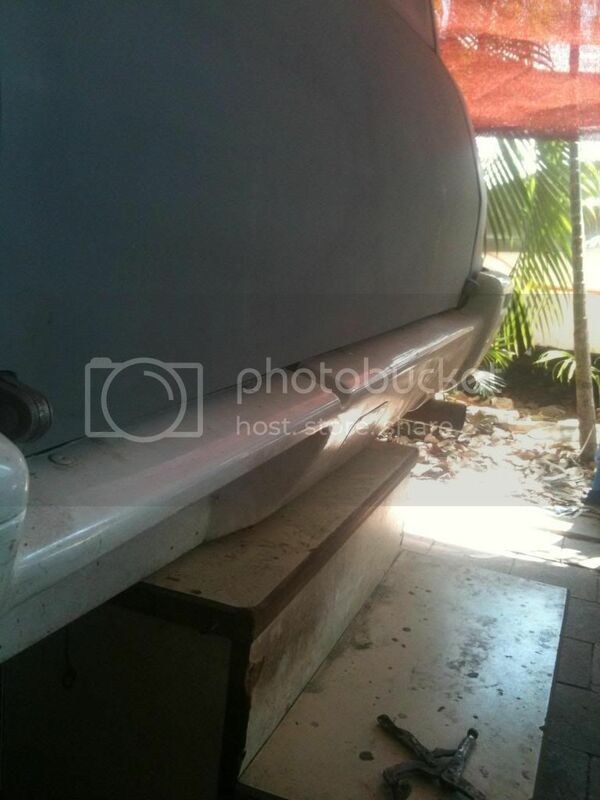 I'm toying with the idea of this SSV fibreglass body kit that I managed to get really cheap. The side skirts look cool IMO but the rear bumper pods, sort of, doesn't do it for me. I reckon it looks a bit unfinished, with nothing across the back under the tail gate and it sort of doesn't really match the profile of the body, where it meets up at the wheel arch and swage line area and would look a lot better IMO if there were flared guards there for it to flow with? But I'm gonna need some massive rubber filling the wheel arch's to make flares look good. I know you can get flare kits for sedans but haven't herd of any that suit utes or vans rear wheel arch's. Interested to hear what others think? 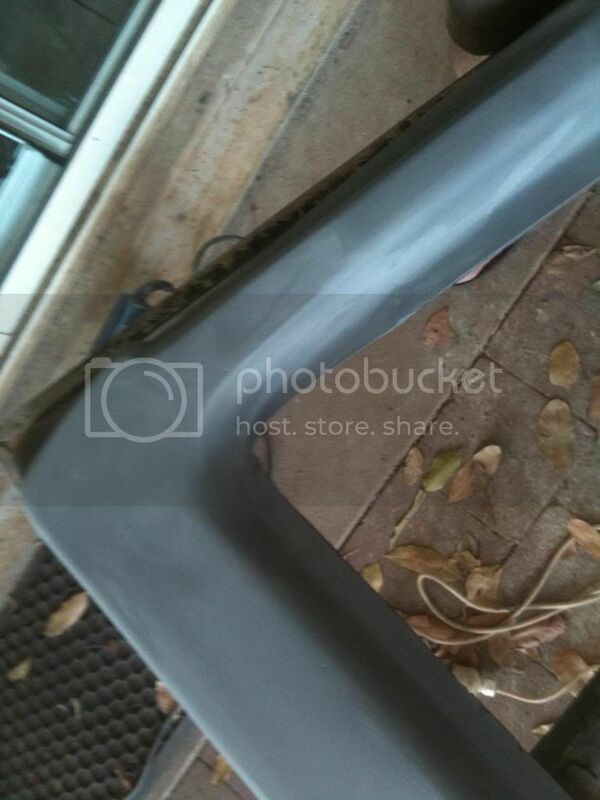 I've also got a BA style front bumper that came with it and a XR bonnet hump. I think the bonnet hump will happen, I've always loved the look on the later model XR Falcons cause it gives that, WOW, there's something powerful under that bonnet look. I hope you don't think it looks too riced out. Thanks man. mmm", yer now there is a good idea man ! 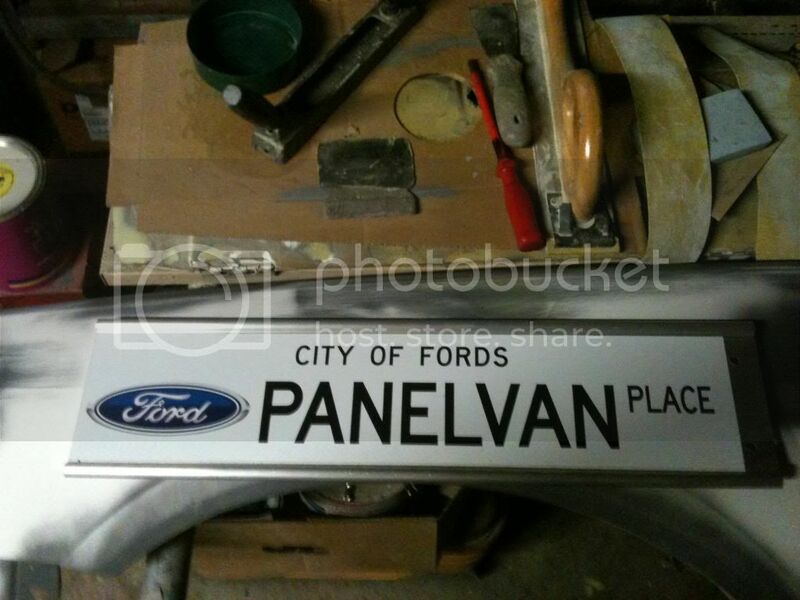 I think I'm gunna call it VANFAC PTY LTD or VANFAB, something along those lines 'haha' I wish. 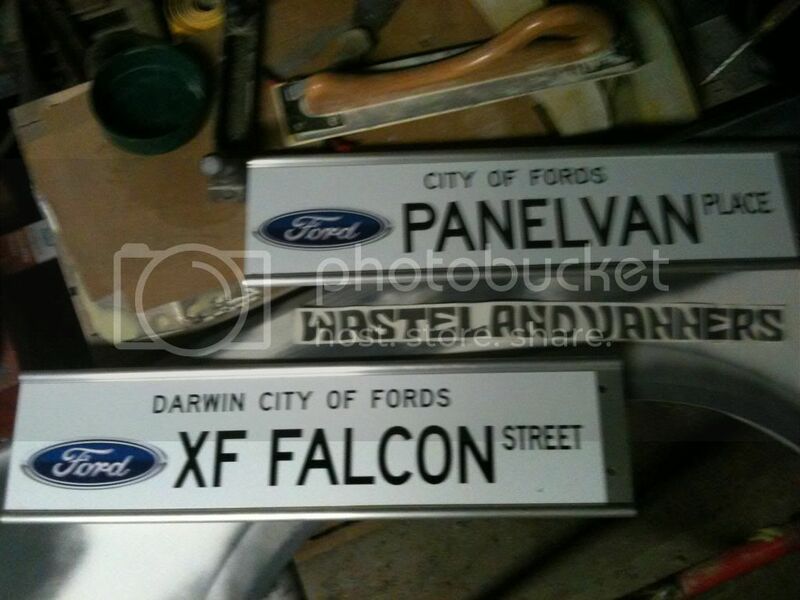 I've already got my own streets here in Darwin.. 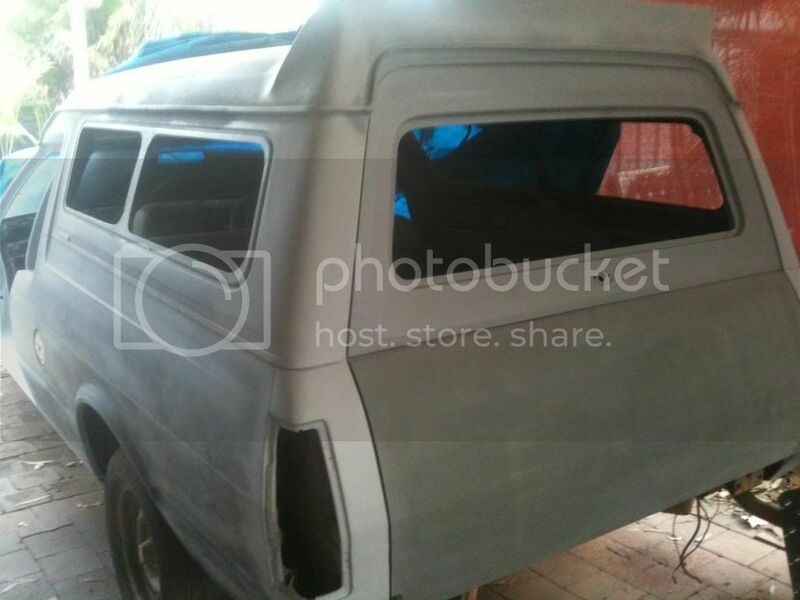 Awesome work on the Rear doors and hinges, did this to an old Bedford van, but all we had was original doors, had to weld em down the middle then cut them horizontally, was a big job. Love the new look man. And I thi I may of seen that pano down my way a few weeks back, beige, WA plates, was headed south........ first thing i noticed was the back doors too...... lol . 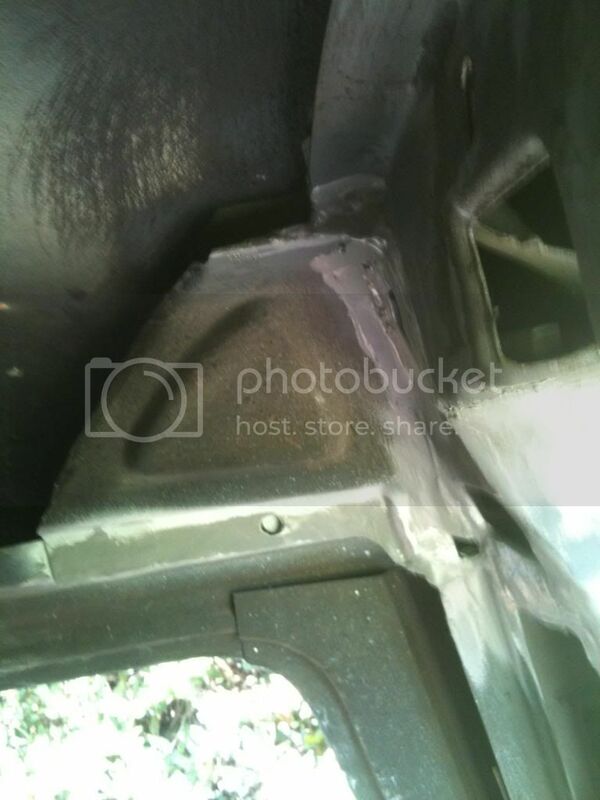 some pictures of my bonnet power bulge, to come when the site lets me upload images ?? ?